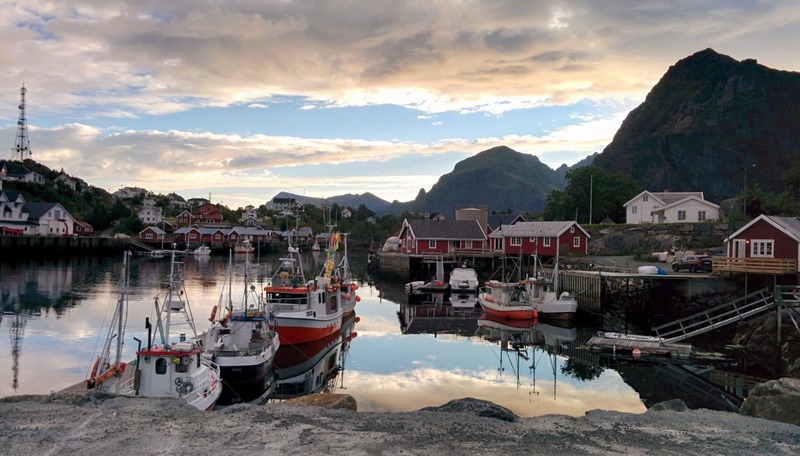 It has been a year that we wanted to go back in Norway and especially visit the Lofoten Islands. Why there ? 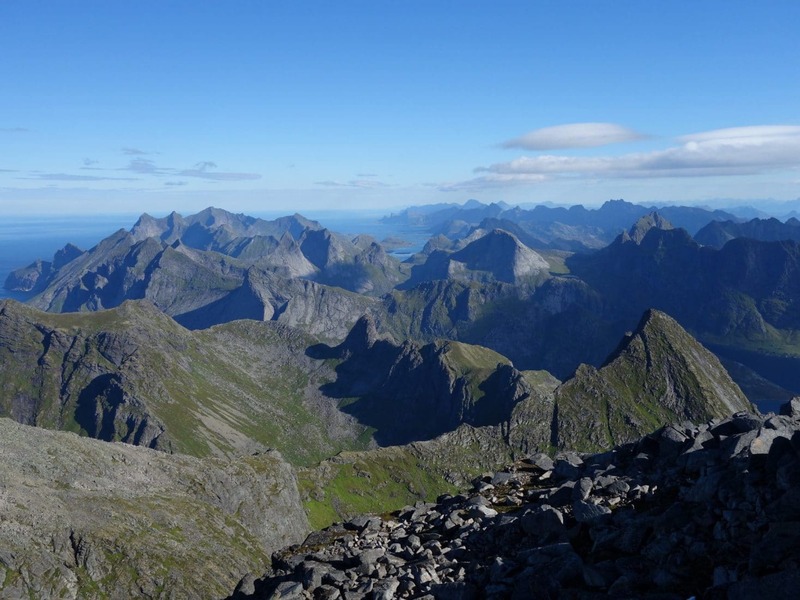 Because Lofoten Islands are a magnificent jewel lost north of the Polar Circle. Imagine kilometer high mountains with their feet in the ocean. 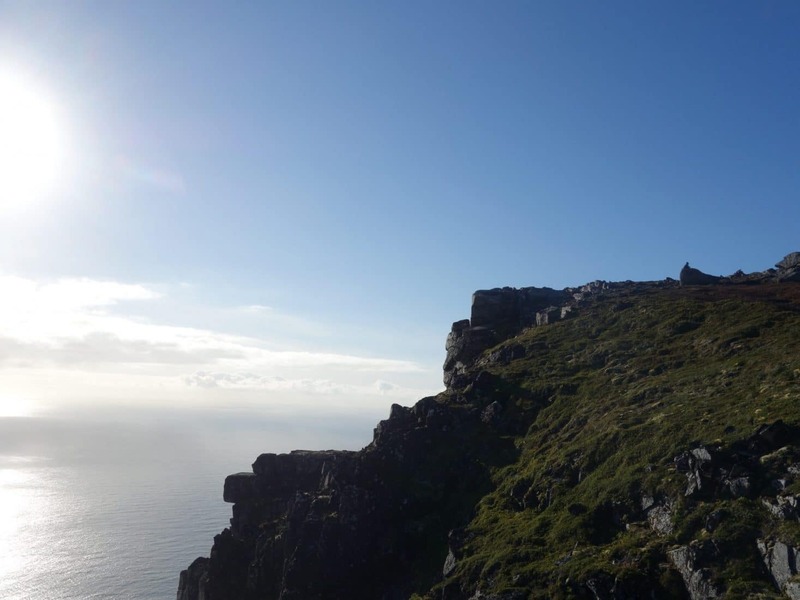 You begin your hike just by the sea on the morning and walk in high mountains by noon ! 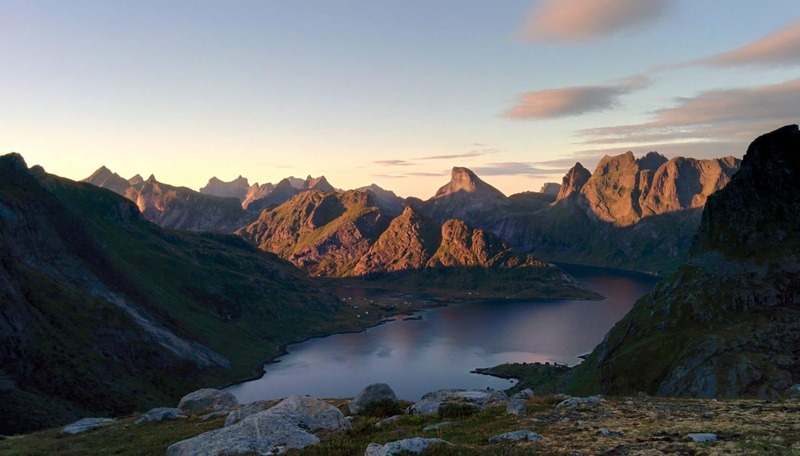 Lofoten are unique and magical. 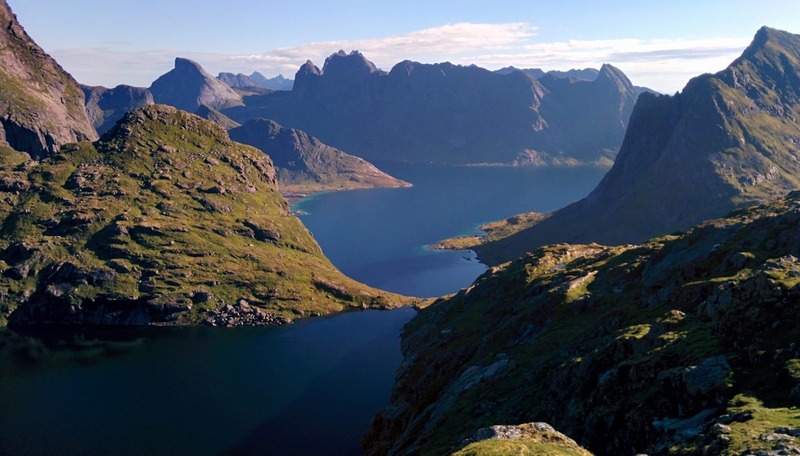 Located between 67° and 69° north, the Lofoten Islands are 300km north of the Polar Circle. The archipelago is 150km long in the north Atlantic. Despite they are located far north the climate there is quite nice due to the Gulf Stream which bath the islands. They are seven main Islands (from East to West) : Austvågøya, Gimsøya, Vestvågøya, Flakstadøya, Moskenesøya, Værøy, Røstlandet. People living there are mainly of the shore because the inside land is mainly sharp mountains. 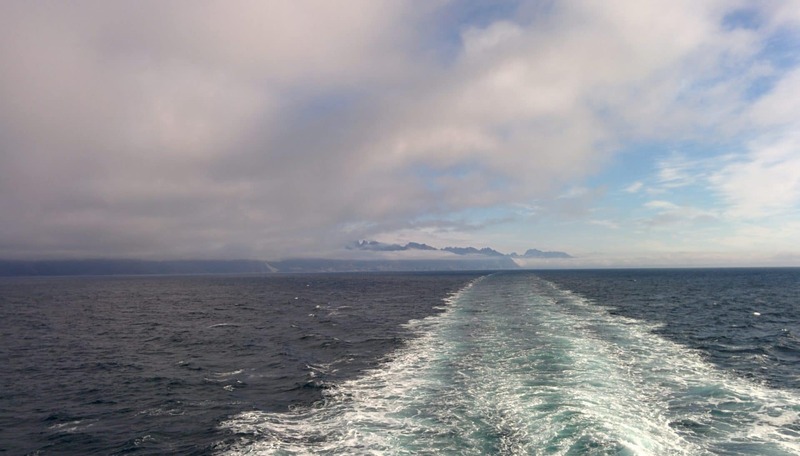 by ferry from Bodø : from there you can go the Moskenes, Svolvaer or Stamsund. 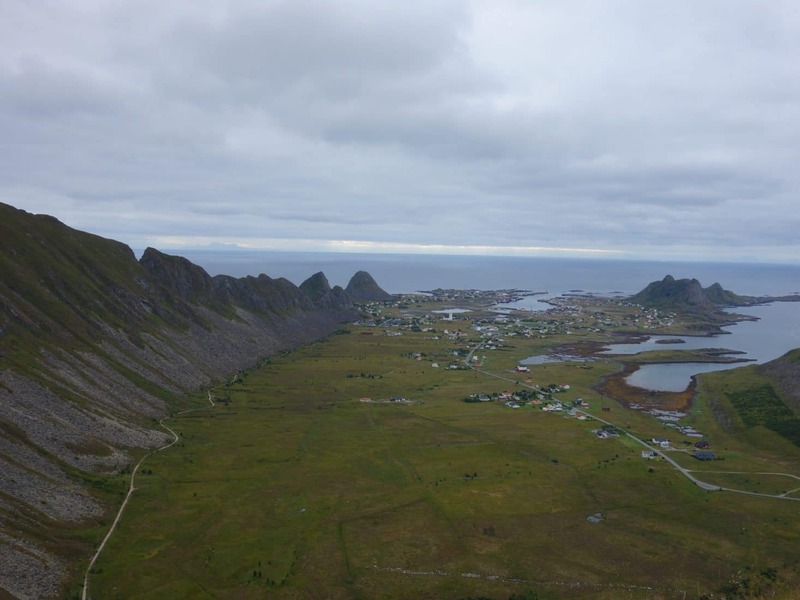 by plane : there are two small airports on the islands : Leknes and Svolvaer. There are regular flight every day. The train is 17h long but we like this soft way to travel. It allows the traveler to appreciate the moment, to enter slowly in his new environment. 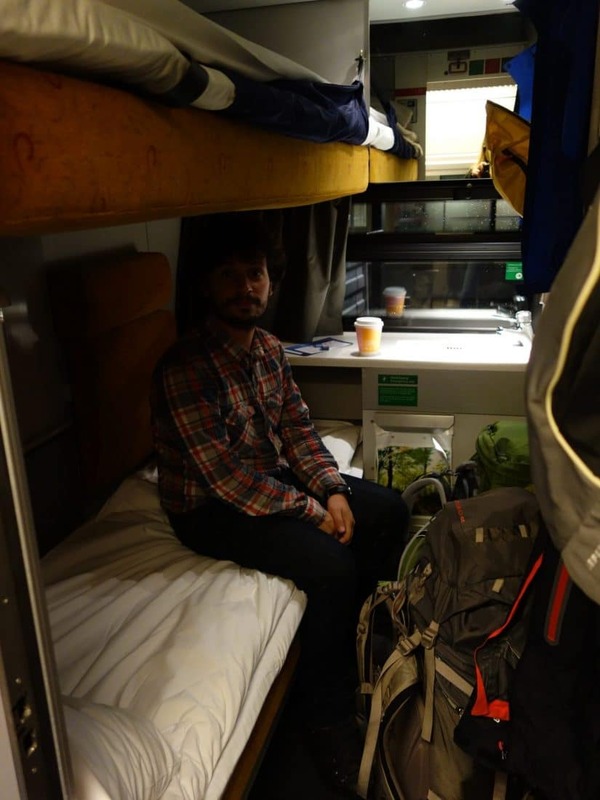 The Norwegian train are especially comfy thank to the private double compartments so the 17h were fine. At last Svolvaer ! It’s just been a flight, “few” hours of train and a ferry but now we can really start. The hike begin on the road in the direction on Kleppstad. The beginning of the path is located near the Lille Kongsvatnet after the bridge over the Straumen, next walk toward the small power station. This part is not very interesting. 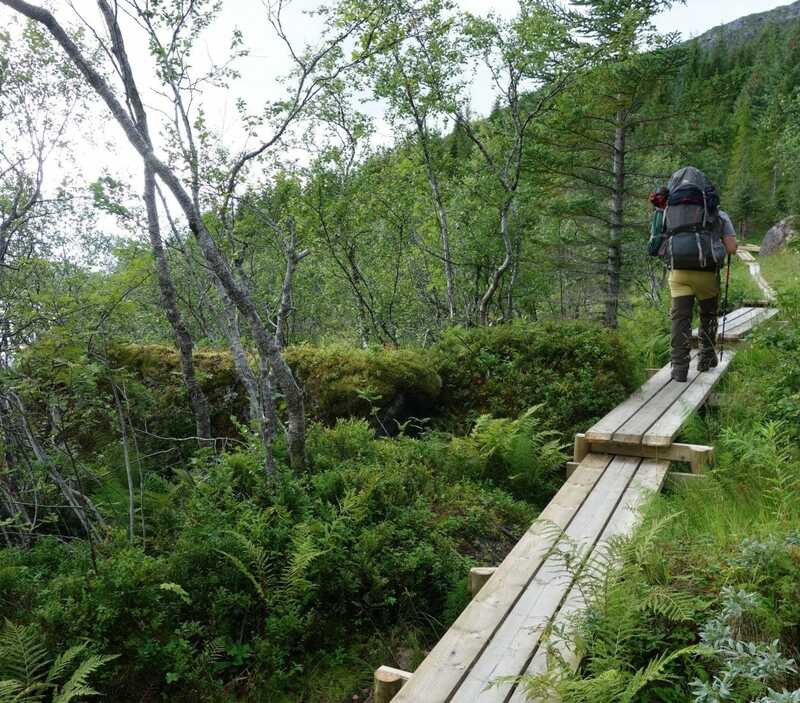 The “real” path begins after that, following the Stor Kongsvatnet shore. We are walking quite slowly because of our backpacks full of food, the time to warm up but also because the ground is wet and muddy. 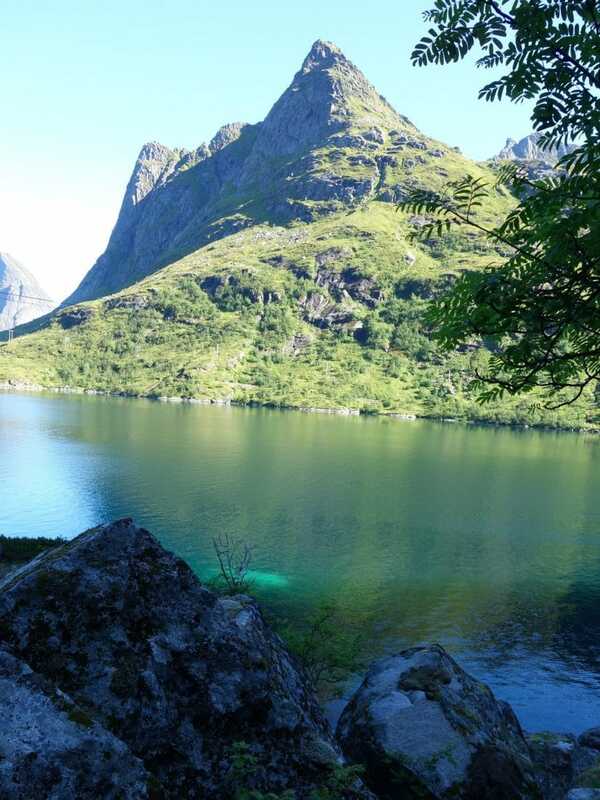 In any case we are happy to be there and to discover the Lofoten ! 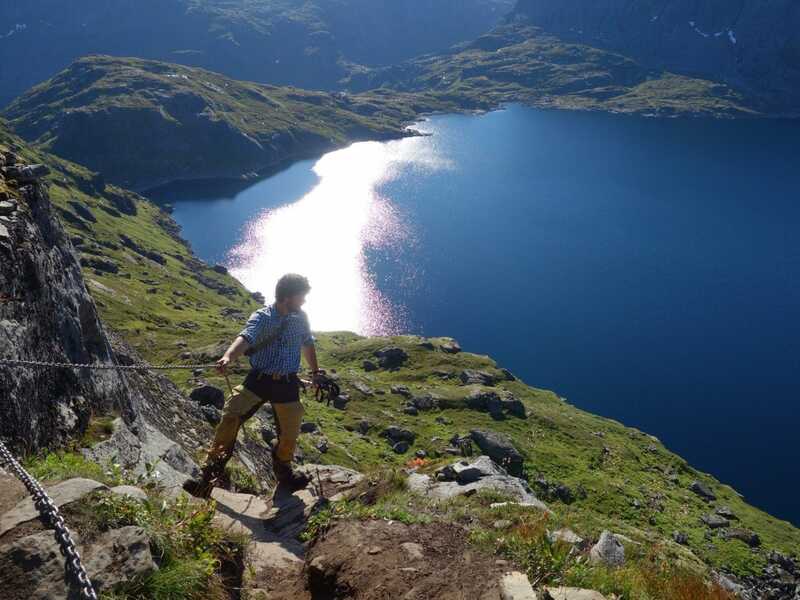 After a bit of time we arrive to a smal hydroelectric power station where we turn right to begin to climb to the Damvatnet. 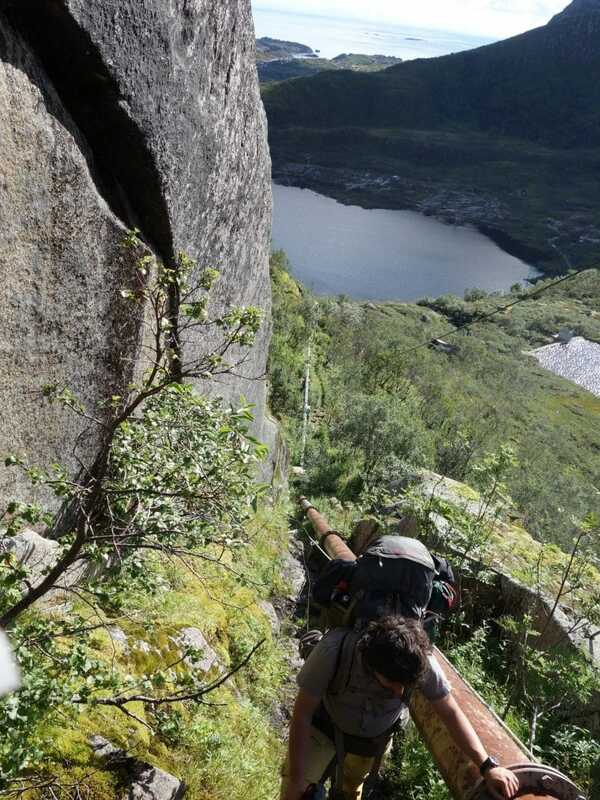 The bags are heavy on this first ascent but it’s ok… It’s around noon so we have a small lunch close to the lake. The view is beautiful on the lower lands with lakes and the ocean in the distance. On the top weather begins to be be cloudy but the view is nice. No more trees here just bushes and grass. We are trying to go to a sort of pass to go downhill next but we miss a bit the right path. From he top we can see what is waiting for us : no path, a long way down and a swamp at the end. It is 5pm and there still is a long way to go and no obvious place to stay for the night so I begin to worry a bit for the end of the day. 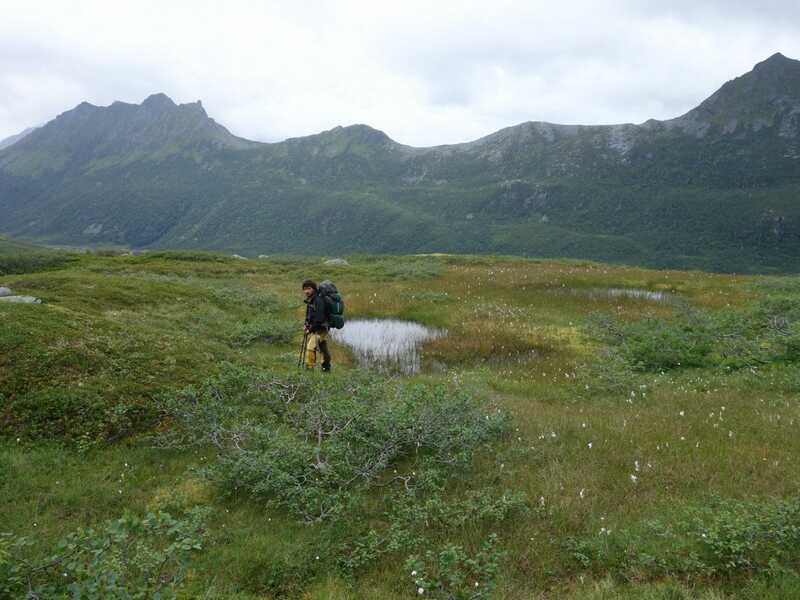 Two hours later we are at the bottom of the valley, it is a swamp, so it will be hard to find a place to camp there. 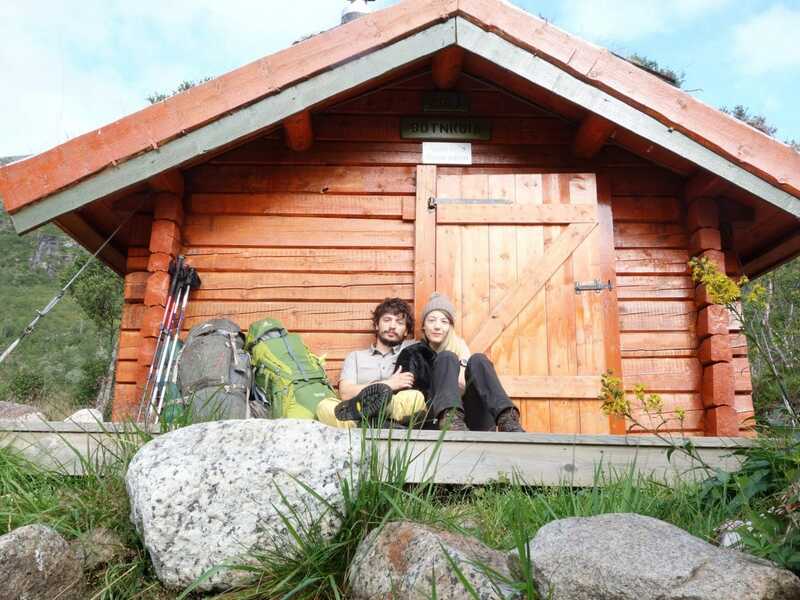 We continue to walk a bit and suddenly we are passing by a small hut with a sign on it : “Open Cabin”, O miracle ! 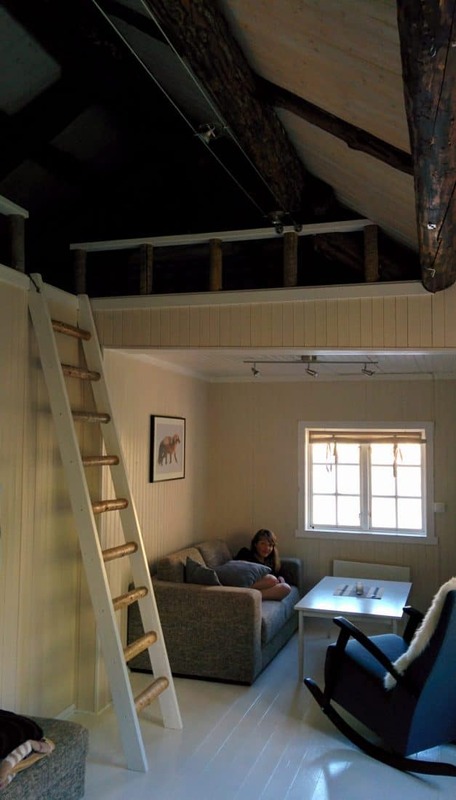 It’s a public cabin where everyone can stay freely. It’s perfect for us tonight ! The inside is simple but just as it needs to be to be comfy : two benches, a small table and a stove ! Perfect. We set for the night, we will be fine here. It has been a long day for a first one ! The weather was not perfect but the landscape were still beautiful. We are going to change our plan a bit : we will do shorter distance and we won’t go to some place because we want to focus on Moskenoya which seems to be the most interesting island. A good night’s sleep ! We are back on the road after a good breakfast, after storing and cleaning and after signing the guestbook. 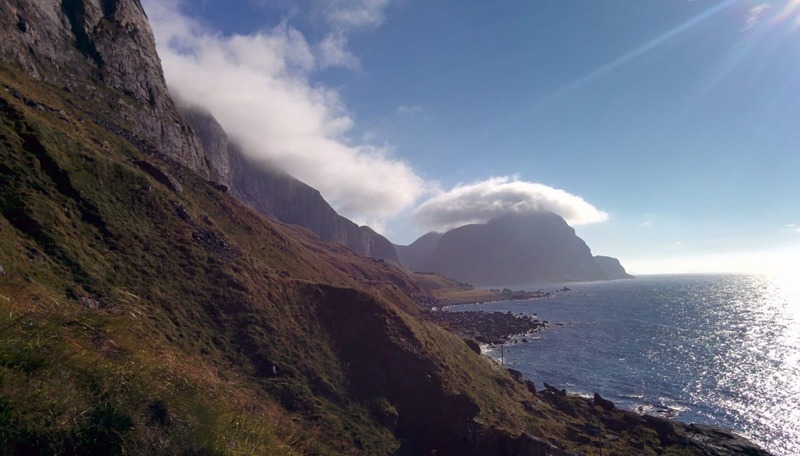 The plan of the day is the following: join the E10 road and hitchhike to reach the beaches of Utakleiv or Haukland, we will see on site where spend the night. We chose not to go through Vestvagoy because according to the map it is mainly the relatively flat wetland and we want something else. The weather is sunny this morning. 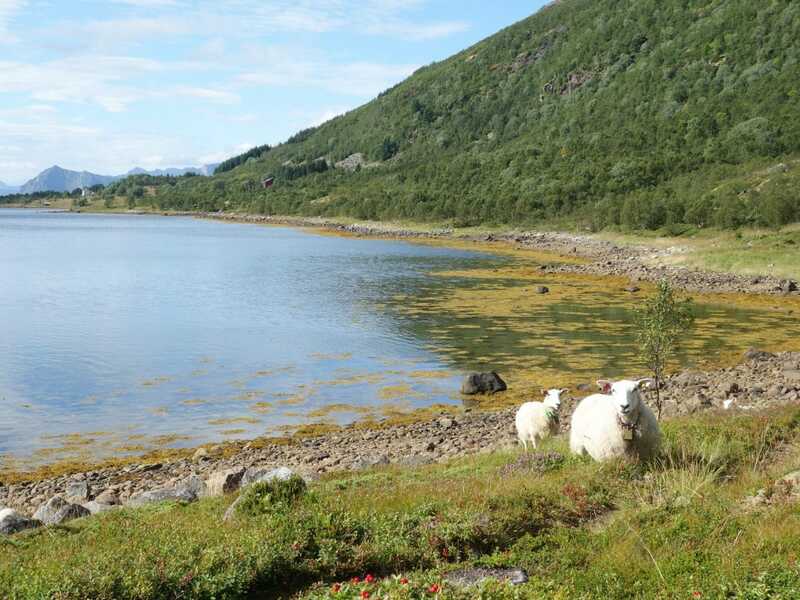 It will take us 1h30 to reach Kleppstad along the coast of the fjord. The path is nice. We try to find a strategic place to start hitchhiking and it seems to work because a couple stops to take us after a few minutes. 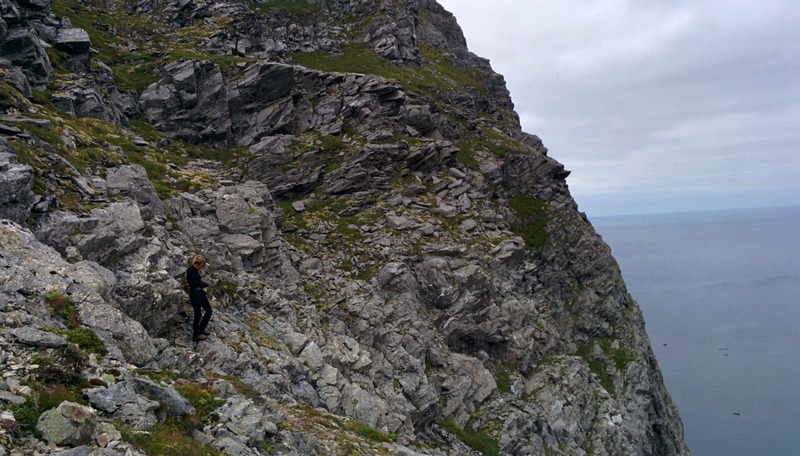 Those are two Swedish climbers who spend a little time in the Lofoten. There are many possible and very wild ways given the number of parishes there are. They will drop us at the intersection between the E10 and the small road that leaves towards the beaches (Leiteveien). We will try again to hitchhike because the prospect of walking on the road for 2 hours does not please us too much. 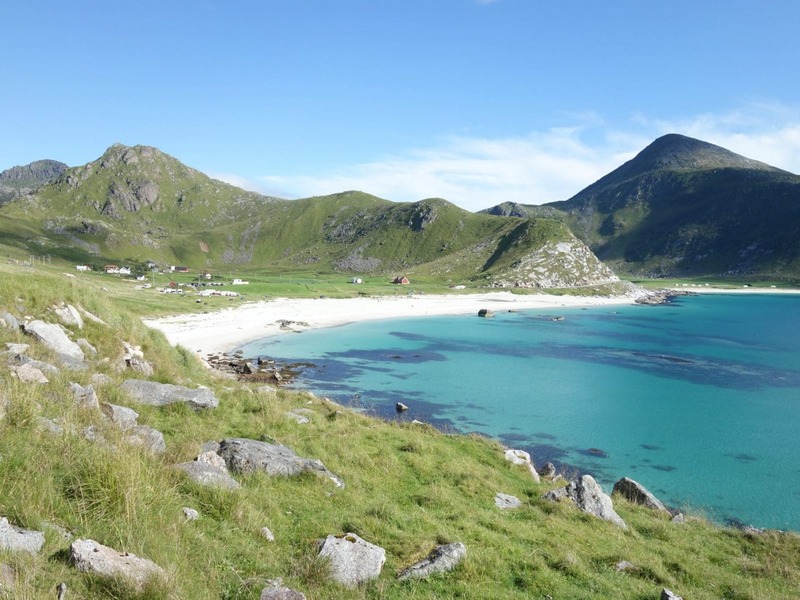 Our new driver will leave us on the beach of Utakleiv. The beach is very beautiful and wild, there are few people. 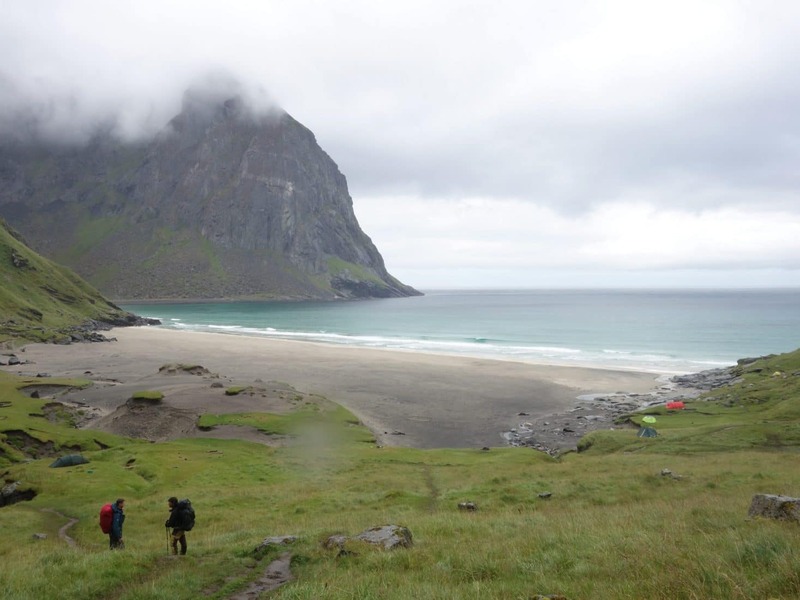 We wanted to stay on this beach initially but between the wind which strong, lack of water point and also a weird sign about the price of the night on the beach, we decide to return by the coastal path to Haukland. This path is beautiful and allows you to discover the beach as we walk. 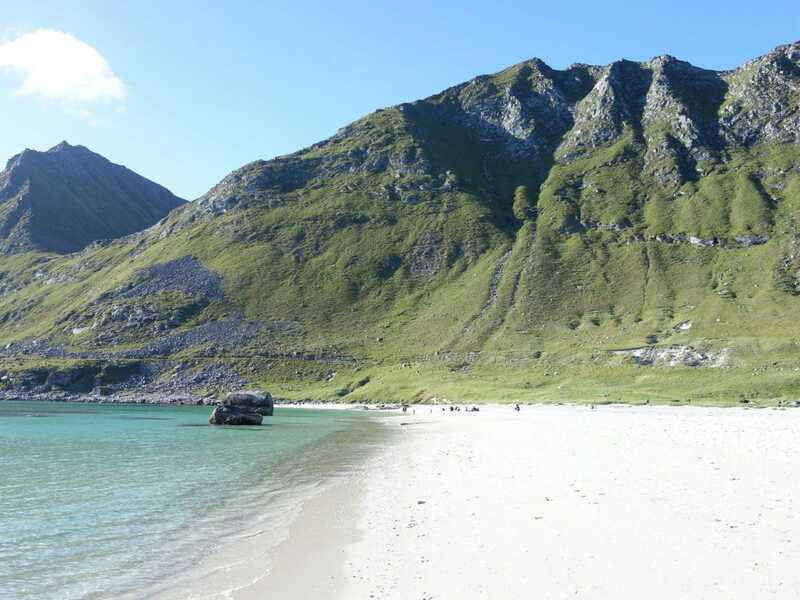 Haukland is a very pretty white sand beach nestled in a cove with crystal clear waters. It makes you want to swim there if the water had not been so cold. 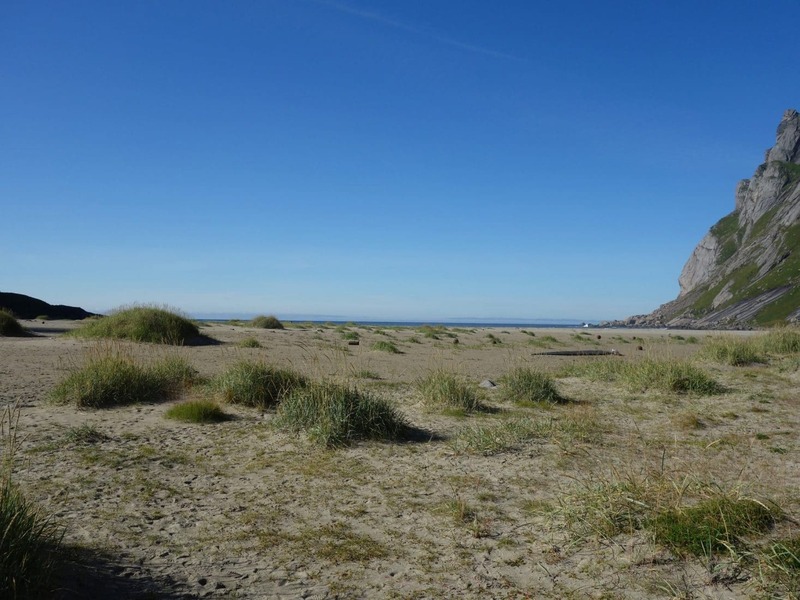 Behind the beach is a large grassy area perfect for setting up the tent. Unfortunately the car park that is behind attracts people and notably a lot of motorhomes. Tonight we will not be alone but the closest tent should be 20m away from us, not to bother us. Interesting point : there are washrooms on parking which also offer an easy water point. So we set our camp just behind the beach next to a picnic table. 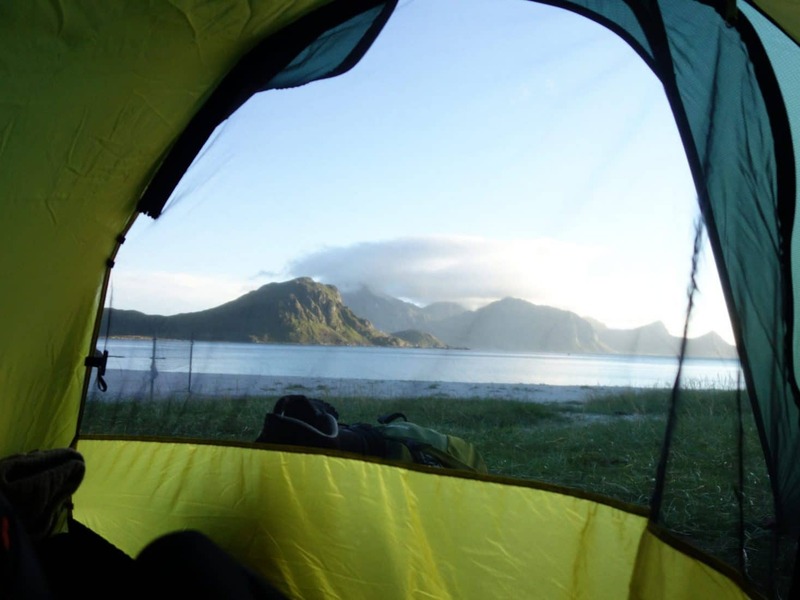 The entrance to the tent is facing the sea, it is sunny, life is beautiful. 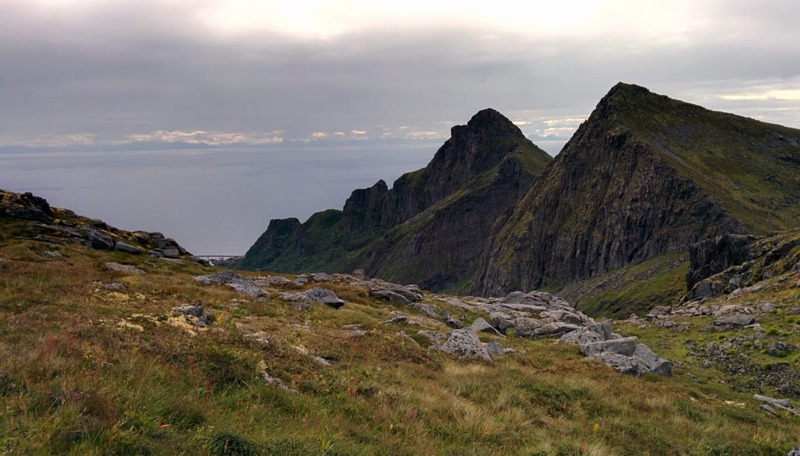 From its height of 489m, the Veggen which is located between Utakleiv and Haukland is reachable on foot from the beaches and offers a superb view. It was a small walking day but we needed to rest after the trip and the first day of walking. Anyway the goal is not to run but to enjoy. What we will do during the afternoon on the beach in the sun. Waking up to the sound of the waves and under the sun by 68 ° N … What a joy! The program of the day is relatively simple. 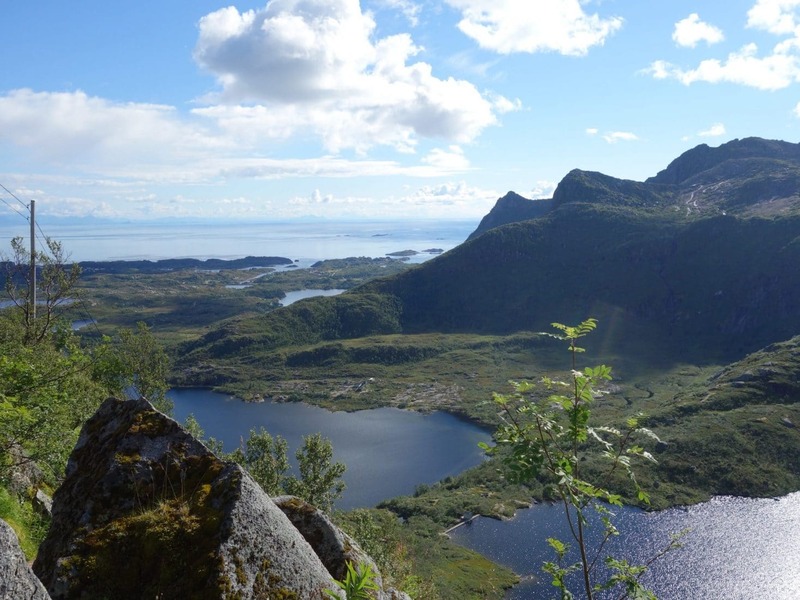 Join Nusfjord and hike to Nesland. The choice of this day without much walking is justified by the weather of the next days that will not be great, so we prefer to see the village under the sun. We also have to take into account that we will have to hitchhike to cross a tunnel (without pavement) to change island. So we get ready early in the morning. 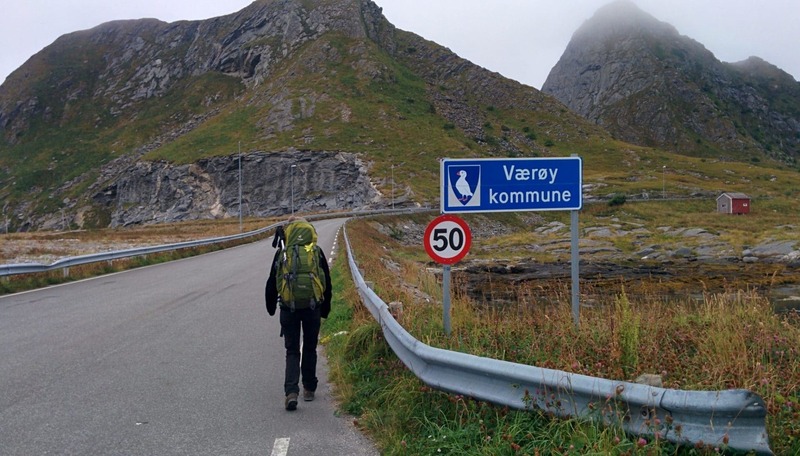 Our first goal is to join the E10 at the crossroads with the Offersøyveien just before the tunnel. 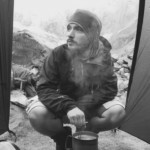 We will walk, it is not a very interesting part due to the relatively poor landscapes. We finally arrive at the crossing with the E10, so we start our hitchhiking mission. It will take us 1h30 in the wind and after several disillusions for a couple of Norwegians to stop finally. 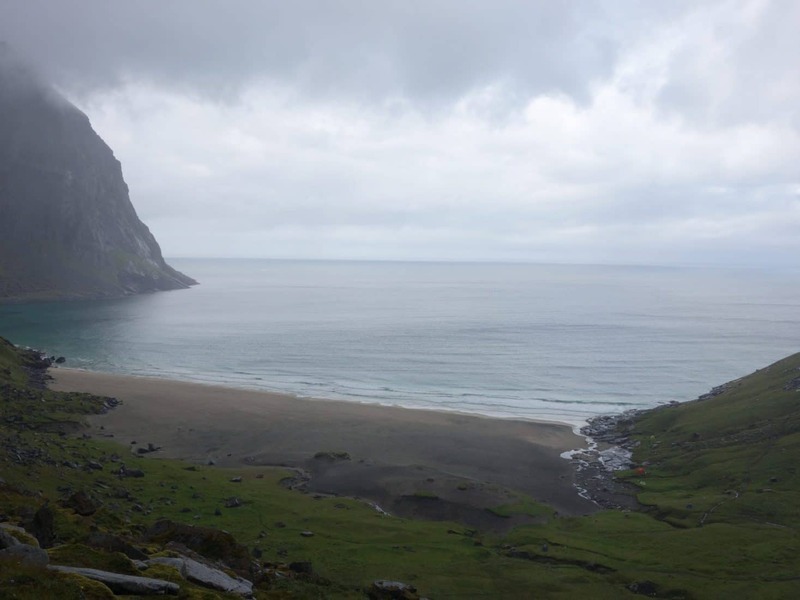 We ask them to drop us at the beginning of the FV807 which leads to Nusfjord but after explaining to them what this small village is, they decide to go there and deposit us there. Perfect! The road is nice and we feel that the landscapes are becoming more and more mountainous. 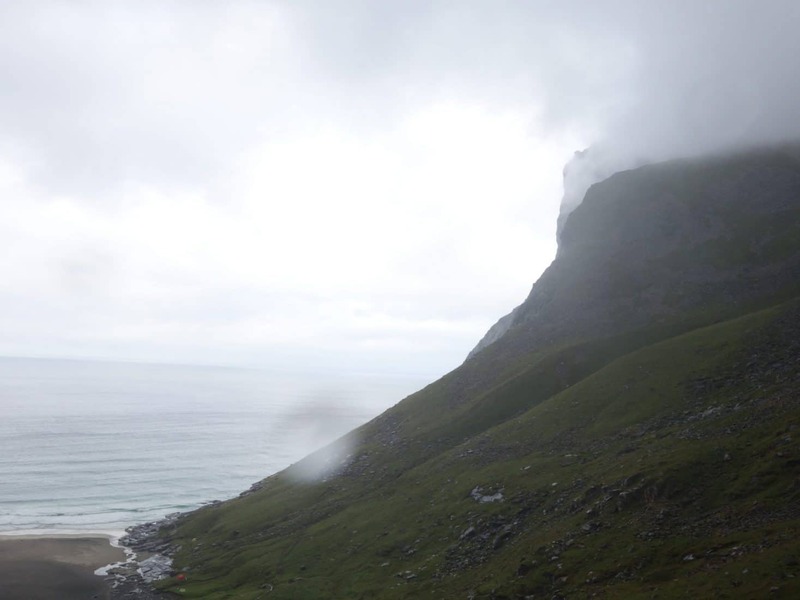 We will finally arrive in Nusfjord around 1pm. 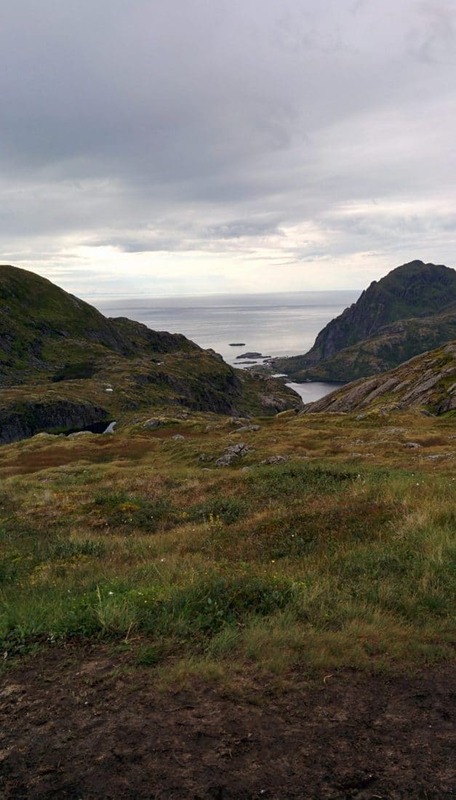 This village is said to be the oldest of Lofoten. 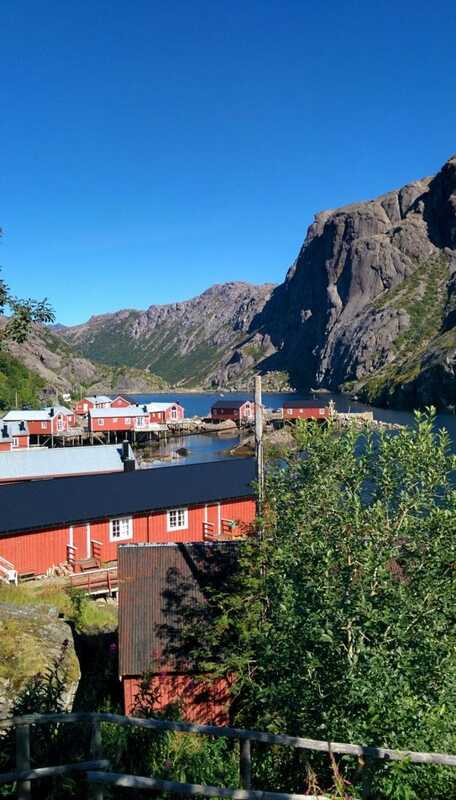 It is an old fishing village converted into a museum village and listed on UNESCO’s “Sites to be Protected” list. We wanted to go there but we were afraid it would be just a tourist attraction where Tour Operators dumps tourists straggling with photos. Well no ! We were very pleasantly surprised, there were few people and the charm of the village is intact. 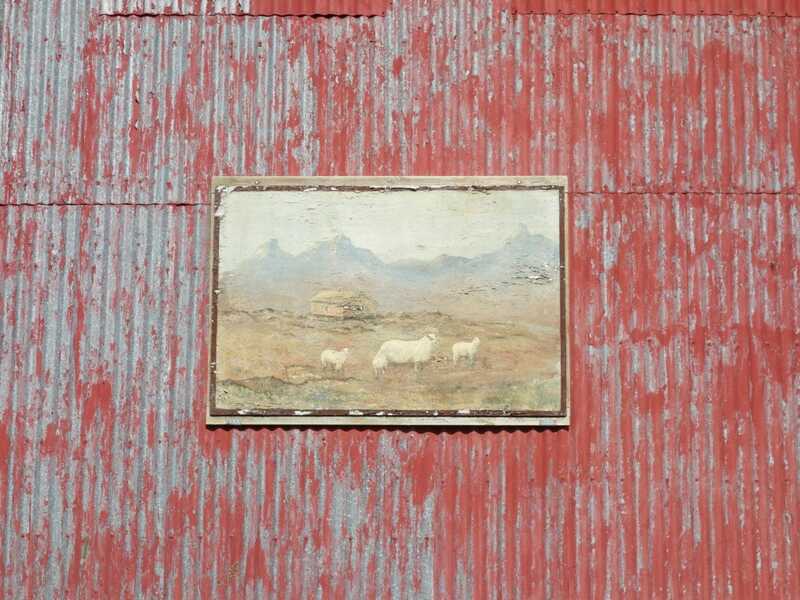 This one has been preserved in the style of a typical “fishing village”. So of course there is a souvenir shop but it is “hidden” in the building of the old grocery store (there are also some fresh but overpriced products!). 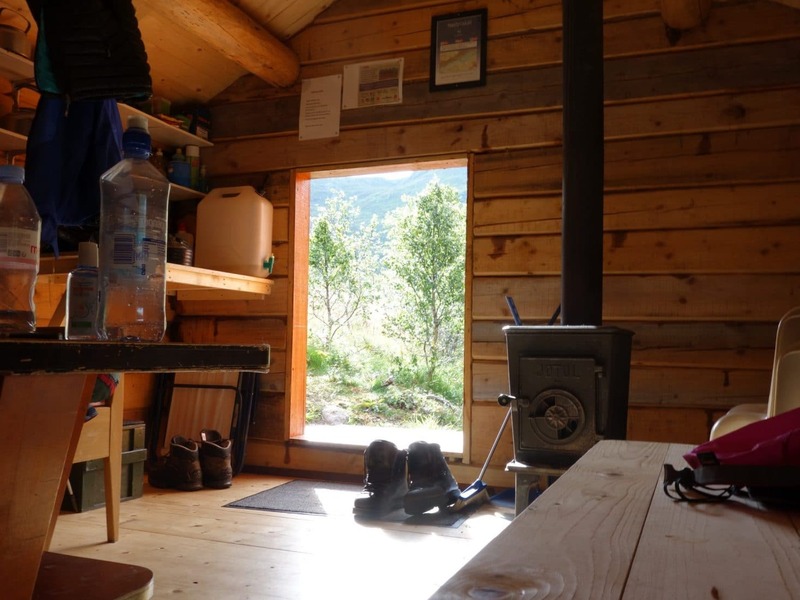 The Rorbus are to be rent (but Norwegian price …) with a superb view of the fjord. 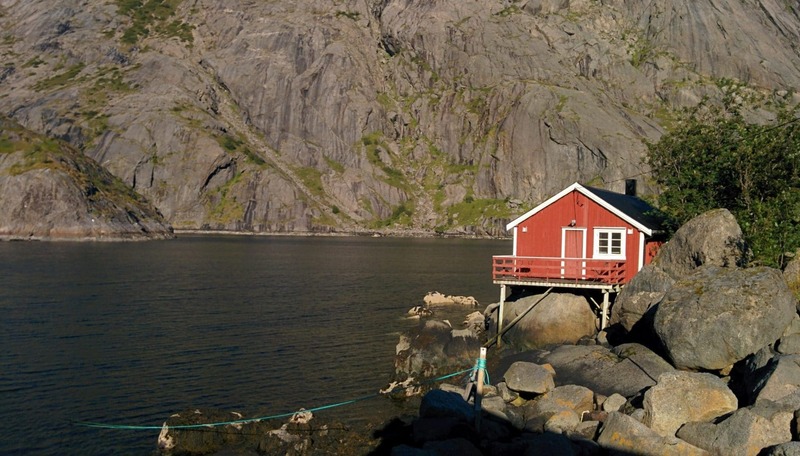 The Rorbus are fishermen’s cabins mounted on stilts and laid directly on the rocks of the coast, feet in the water. 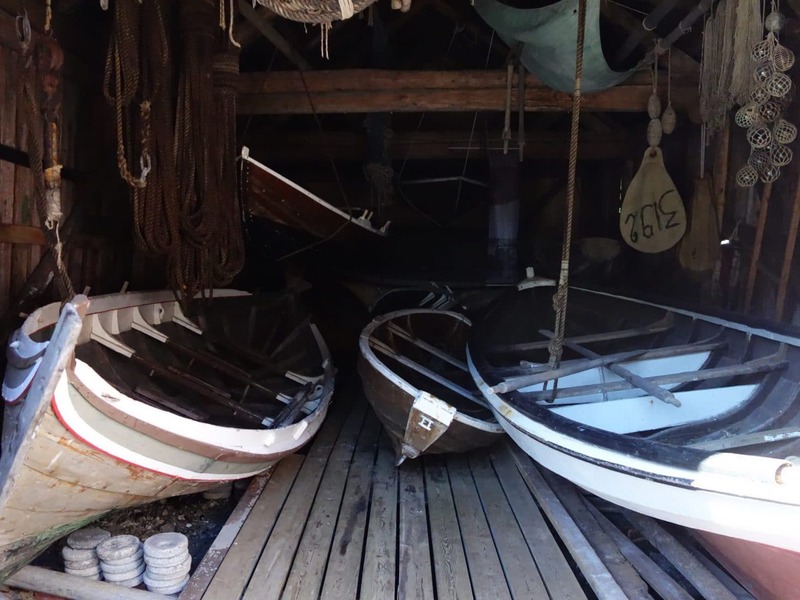 To sum it all up, I advise you to take a tour in Nusfjord, some rorbus have been transformed into a museum exhibiting old craft or old fisherman’s material. We pick up the keys of our rorbu, after leaving our backpacks, we decide to do the Nusfjord-Nesland hike which is reputed. This one starts from the end of the village and follows the coast to the hamlet of Nesland. The coastline is beautiful during the walk especially under the great sun that we have today. One could believe oneself in the south of France with this crystal clear water. A small navigation error causes us to lose some time. In the end we will only make half of the hike in order to enjoy the village in daylight. The walk is really worth doing. First day of rain this morning. The awakening is longer than expected especially when you are warm in a real bed and you know that you have to go walking in the rain … Anyway we have to go. We are therefore on the road to go up towards the E10 direction Kvalvika. This part is not pleasant. We are along the road with little or no place to walk, there are few cars but not a lot of trucks and buses. All in the rain is not folichon. Once on the E10 we hitchhike with very nice locals (again no choice because there are road bridges to pass). 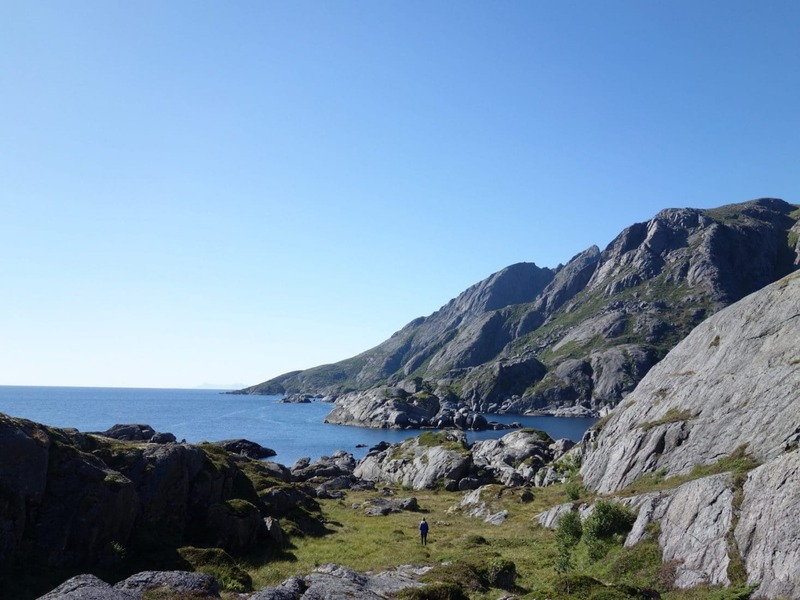 First we wanted just to be dropped off at Ramberg but the couple suggests us to drop us at the beginning of the path! Our lovely drivers are from Lofoten and lived there all their lives. Today retired they take advantage of their day to stroll by car and rediscover their islands. They will leave us at the small carpark which serves as starting point for the hike towards the beach of Kvalvika. The trail, well marked, is simple to follow and is not complicated technically. However, we go through soggy areas especially after the rainy morning. The path to the beach begins by climbing nicely to lead to a kind of pass to 200m altitude. Behind, the trail continues on the descent towards the beach in a more rocky terrain. Everything being soaked, you have to be careful because it’s slippery. The beach is revealing itself along the descent. 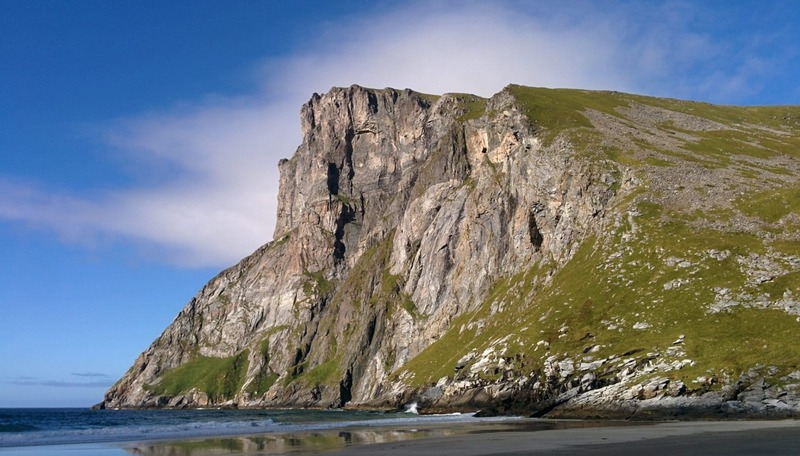 It extends over two coves separated by a rocky outcrop. 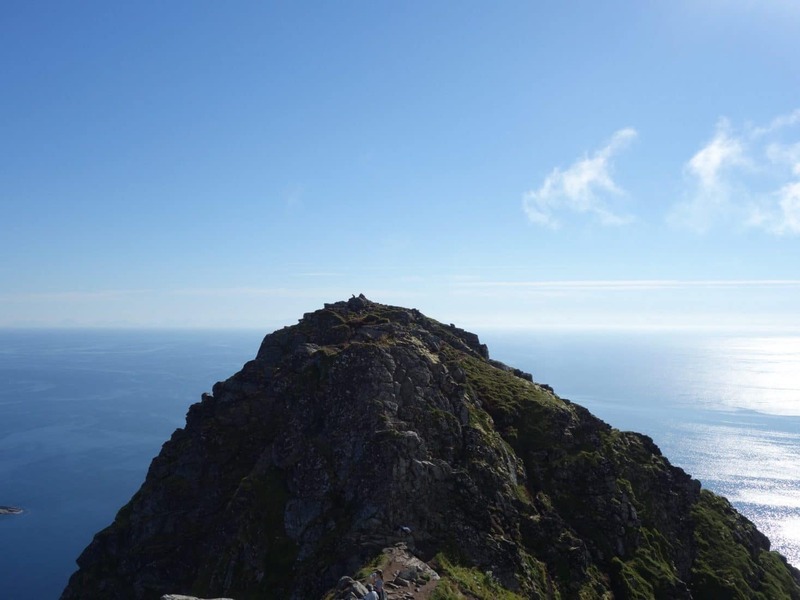 At each end are two summits thus closing the whole, to the SO the Kjerringa (585m) and the NE the Ryten (515m). It is sumptuous, even under the gray veil of this early afternoon. 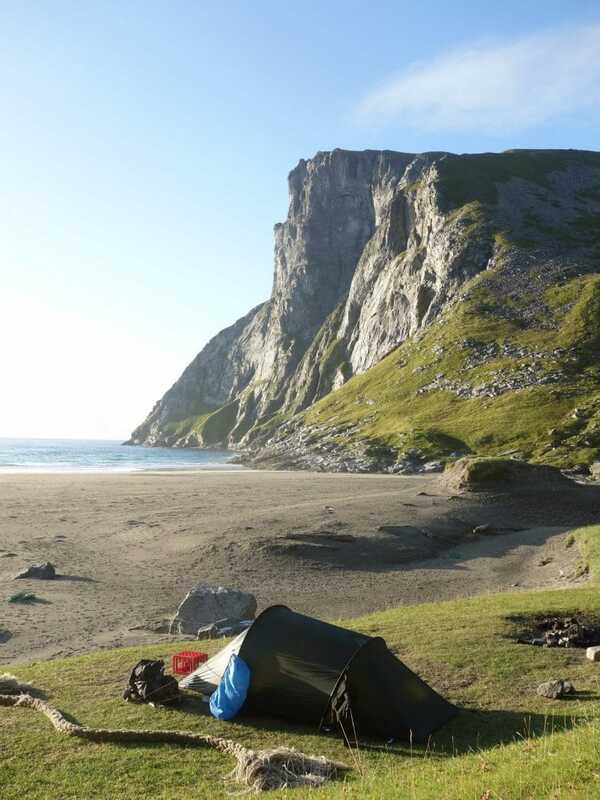 The first beach under the Ryten has to stretch about 500m, a stretch of grass runs all along perfect for a campsite. The second beach is smaller and more insulated. It is also slightly less oriented towards the sun especially in the evening. The place is magnificent and perfect for camping. Unfortunately, there are some rubbish on the beach, the majority being dumped by the sea. 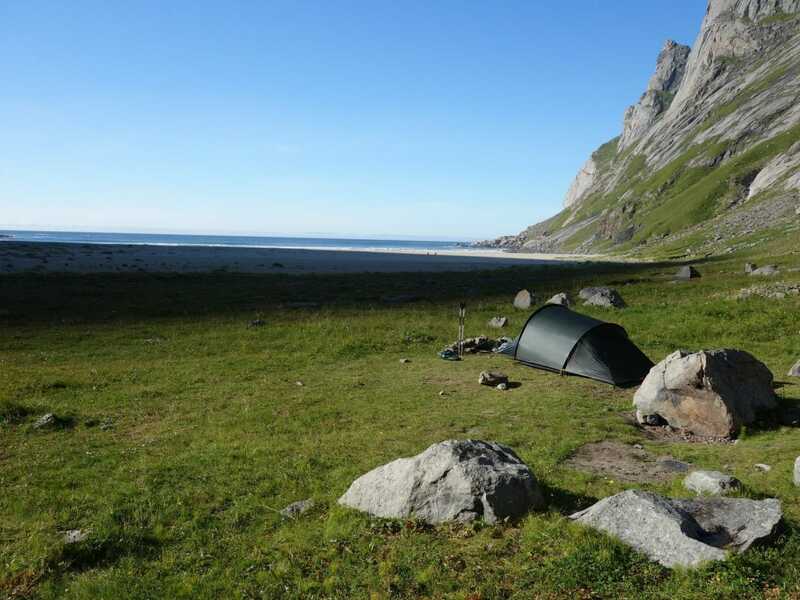 On the SW side of the first beach under the Moltinden (600m) we settle on a pretty flat grassy platform. The weather is always dull but we feel that the sun begins to break through. 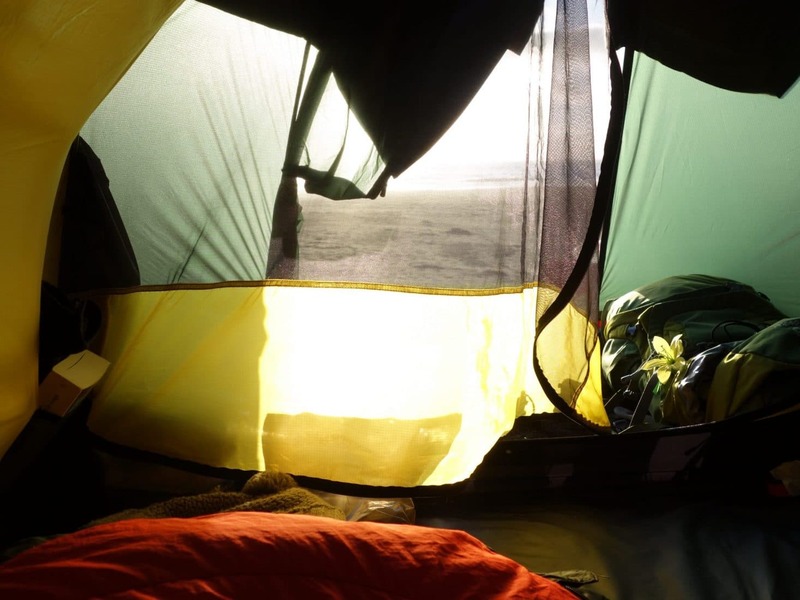 We rest under the tent waiting for the sun to appear. On my side, I go out for scouting and fall 50m away from the camp (next to the path) on a semi-buried hut tinkered in the hollow of rocks. 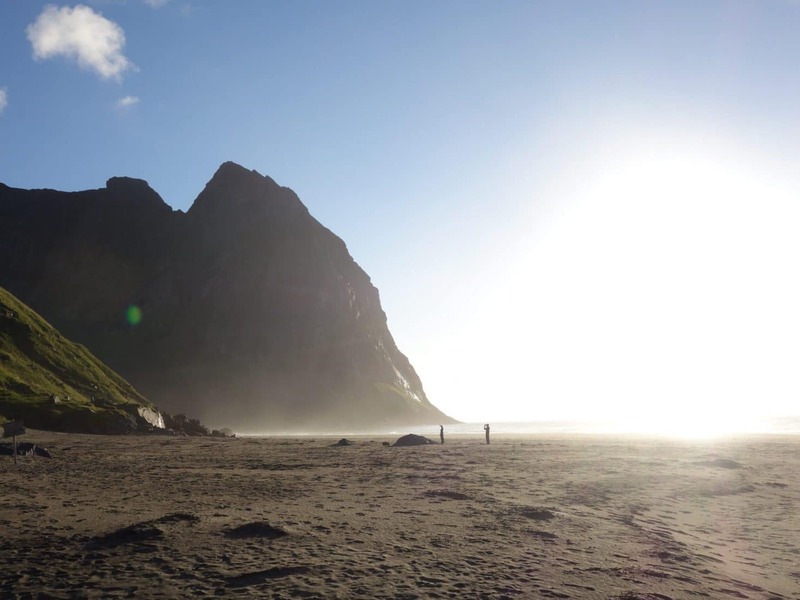 This beach is known to have “hosted” two surfers during a winter, they had built a hut directly on the beach. 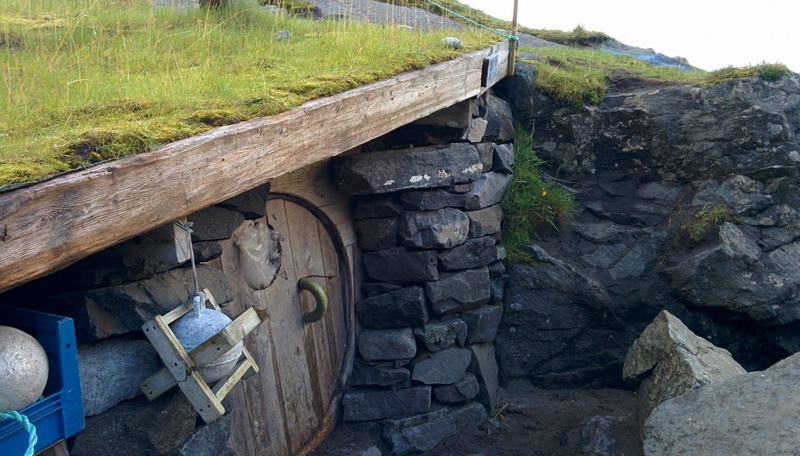 I do not know if this is this one but in any case it looks like a Hobbit hole with its round door. The sun will finally pierce in the late afternoon, the beach is transformed, it is even more beautiful under the rays of the sun with the mist of spray, the atmosphere is peaceful, serene. We decide to climb up the Ryten in the evening to enjoy the sunset light. The sun sets at around 11pm so we have plenty of time. 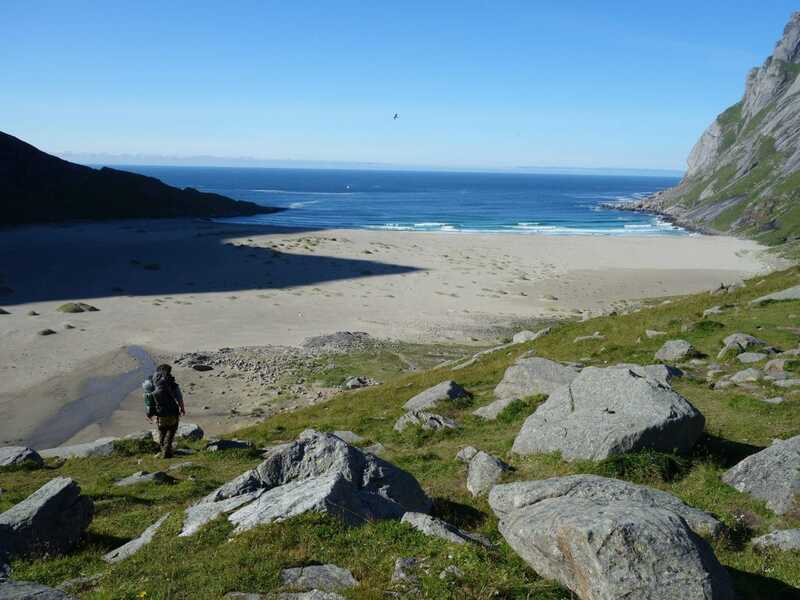 The ascent begins next to the small stream which descends from the Ryten, it is besides the best water point of the beach. 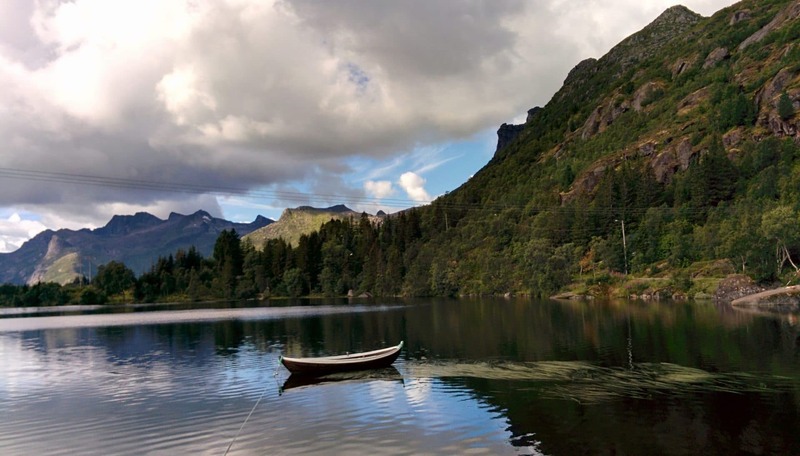 About 250m higher, we arrive at the small lake which nestles in the hollow of this flat place. You have to take on the left a few tens of meters after the lake. We are barely 300m above sea level but the landscape has already completely changed: we feel more in the mountains than by the sea. The following of the path follows the edge of the cliff and ascends gradually towards the summit. The main point of view is a little below the summit. The view is absolutely beautiful and stunning, especially at this hour with the evening light ! 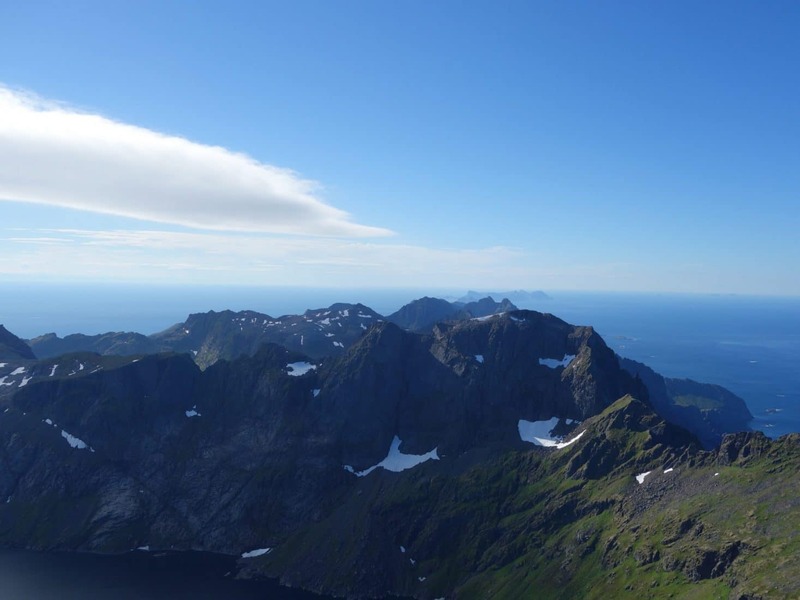 This will be one of the most beautiful views of the trek with the Reinebringen and the Hermannsdalstinden. We enjoy the view and the calm, there is nobody, we are well, it is a beautiful moment. We begin the descent which will be very fast obviously. The end of the day will be peaceful and beautiful on the evening atmosphere. 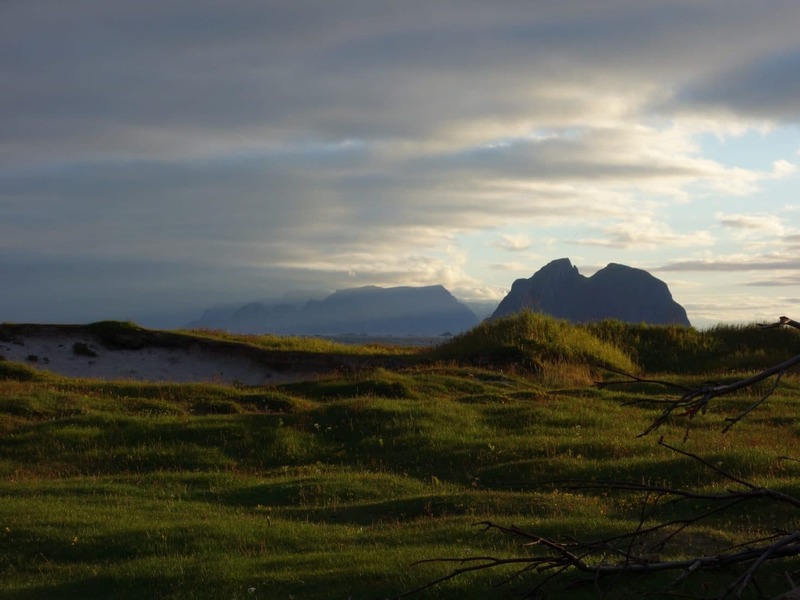 It is only four days that we are here but Svolvaer and France seem already far away. Pleasant awakening by the sea, although the surrounding mountains hide the sun. So it’s a fresh awakening this morning. We get ready to go and resume the ascent to the pass. The rocks are a little less slippery than yesterday. 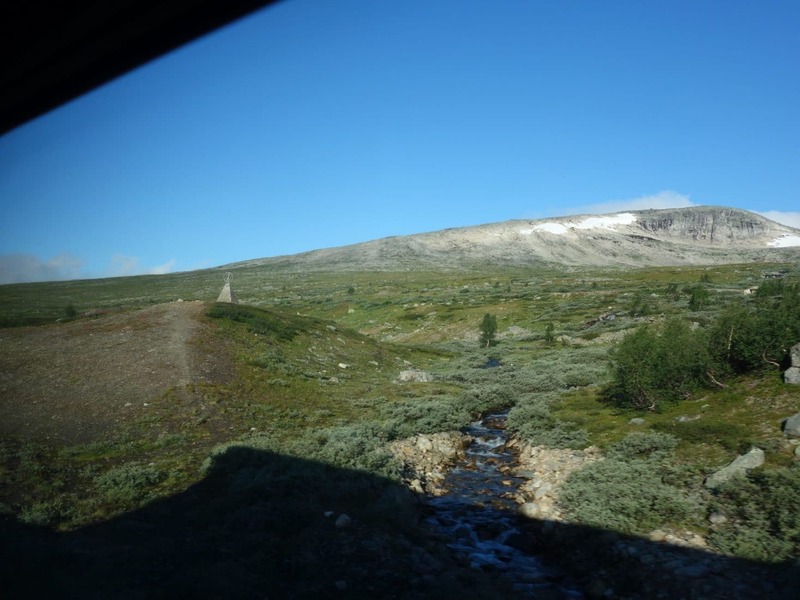 We arrive quickly at the small pass, we already cross some people who come to make the ascent of the Ryten. Last look at the beach that will have been one of the most beautiful places of the trip. We continue on the descent which, it is always well slippery and damp. 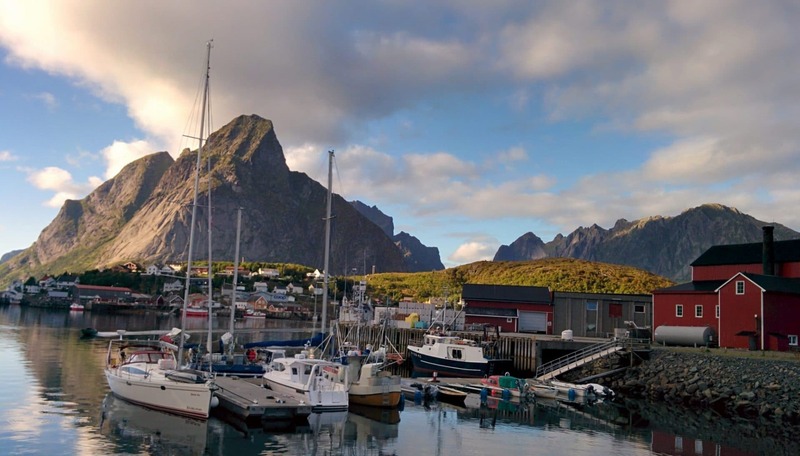 The schedule of the day is to go to Reine, once on the spot we will advise according to the hour. Arriving back to the car park we head towards Fredvang. We will arrive in the small town in an not very exciting hour of walking on the road. We take a break just before the bridge series which will allow us to join the E10. We settled on a picnic area without charm. A few minutes later a large van arrives. We are starting to talk with the driver who is Norwegian. After exposing our plan he proposes us to come with him as he also goes to Reine. We accept and embarks then after having eat a piece with Ian (the driver) and his son.The road to Reine is very beautiful. The journey is high in color. Ian is a great talker and has a lot of story to tell! The arrival on Reine is beautiful, the road passes from islands to islands suspended above the water. 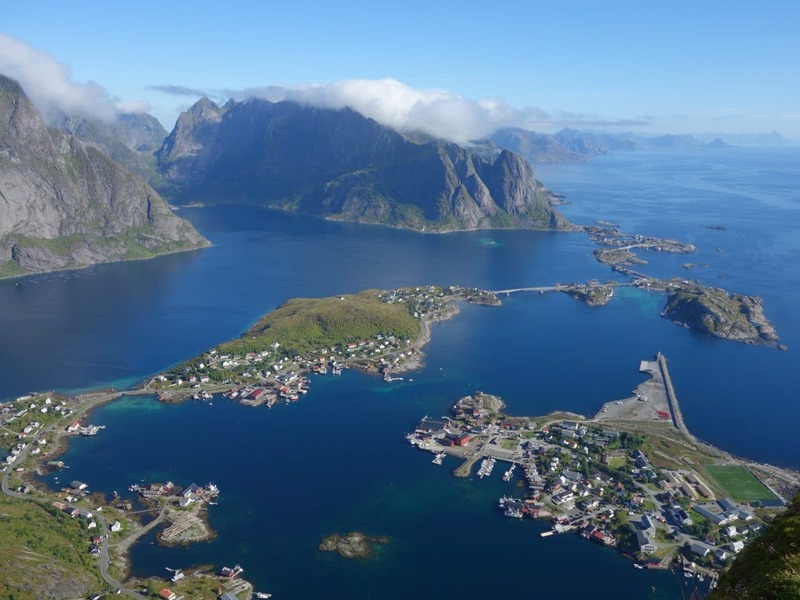 Reine is nested on a small peninsula. The village is built around a central square with pretty wooden houses, including a great cafe that makes delicious cinnamon rolls and good coffee (right next to the kayak rental)! There is a set of Rorbu / hotel which forms a typical ensemble. Ian drops us on the square. We had originally rented a rorbu but we are ahead of schedule and we will not be able to change nights as they are full. So we try other hotels in the area (there must be two more from memory) but the same, there are full. We are a victims of Reine’s success. We need a roof for the night and there are not great campsite possibilities for the night otherwise. In the end we find the contact of a resident who rents rooms for the night. Luckyly she has a room left! So we settle here for the night. 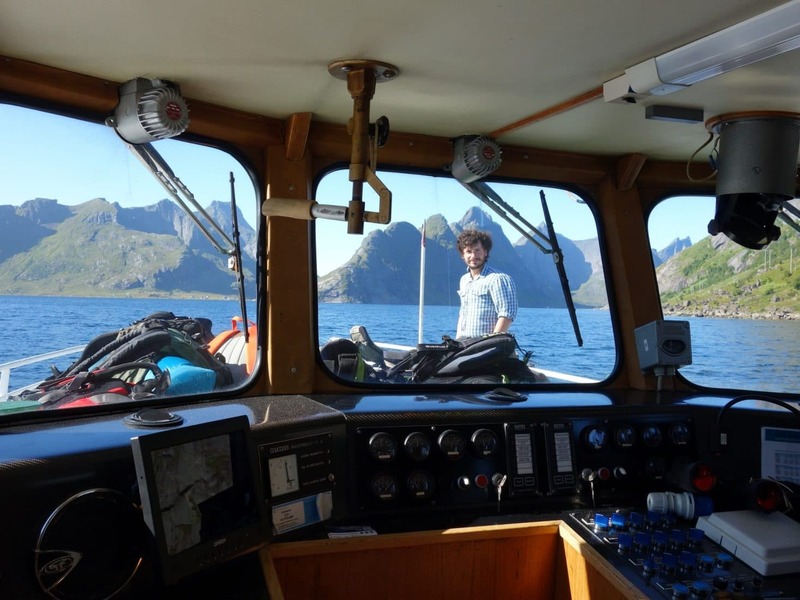 On the spot, we meet Felicie, a Franco-Swiss who spends a month solo in the Lofoten. We debrief the things we have done / seen so far and we exchange tips for the future. In the evening we will dine with Ian, his son and Félicie in the restaurant of the Rorbu hotel which is good. It will be our last day “conveyed” we will do all the follow on foot. The program is simple. 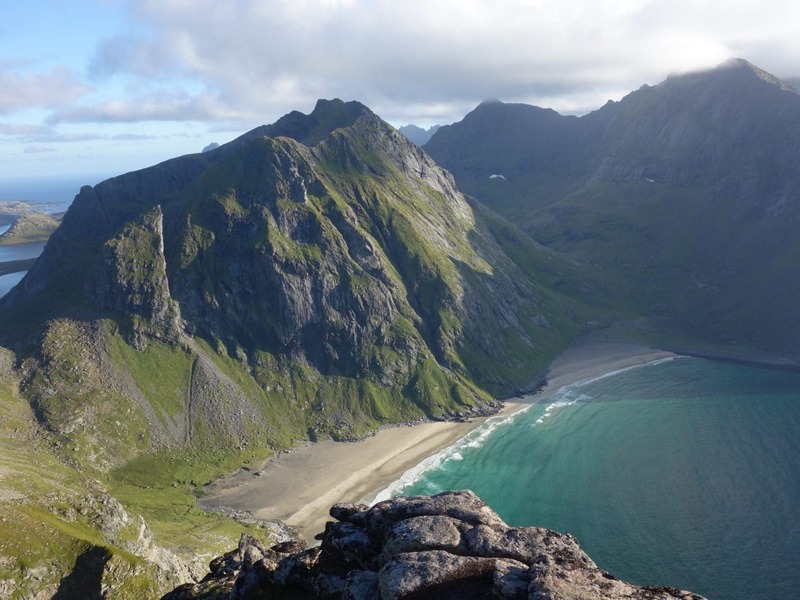 In the morning we head to the Reinebringen (448m) to climb and to admire the most famous point of view of the Lofoten. 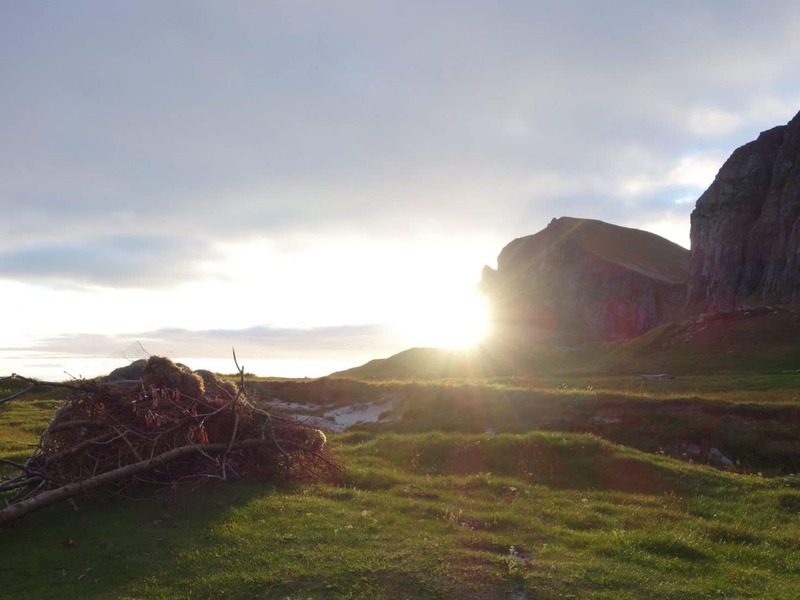 Then head towards the beach of Bunes on which one will join Ian, his son and Félicie. We set off light for our summit of the day. The beginning of the hike meets by following the road (direction Å) over 200-300m. The path is marked by a sign that warns of the dangerousness of the ascent. Regarding this panel and various things that can be read, I think that the path is quite practicable and without other immediate dangers when the weather is dry for a few days, on the other hand it is that in wet weather it can become very slippery. It should be noted that when we went hiking (in 2016), a path was being constructed in order to make the climb more secure. We begin the ascent in the trees. The trail is good and one rises quickly. You just have to pay a little attention to the direction you follow because “false” paths lead nowhere. A little higher up the vegetation clears and the view emerges. You can see the zigzag climb up to the small pass just below the summit. It’s very hot, it’s sweaty. 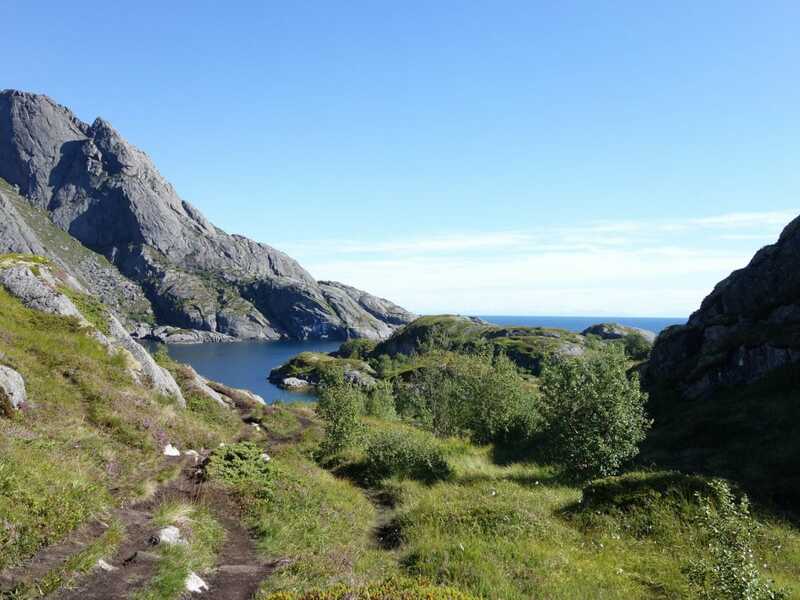 The heat in the Lofoten is all relative but in any case we feel the difference with the previous days. We arrive at the point of view on the other slope after this long ascent. It’s really beautiful. You can see the village below but also the road that runs along the coast and all the islands in the distance. It was well worth the effort to climb here, the reward is worth it! 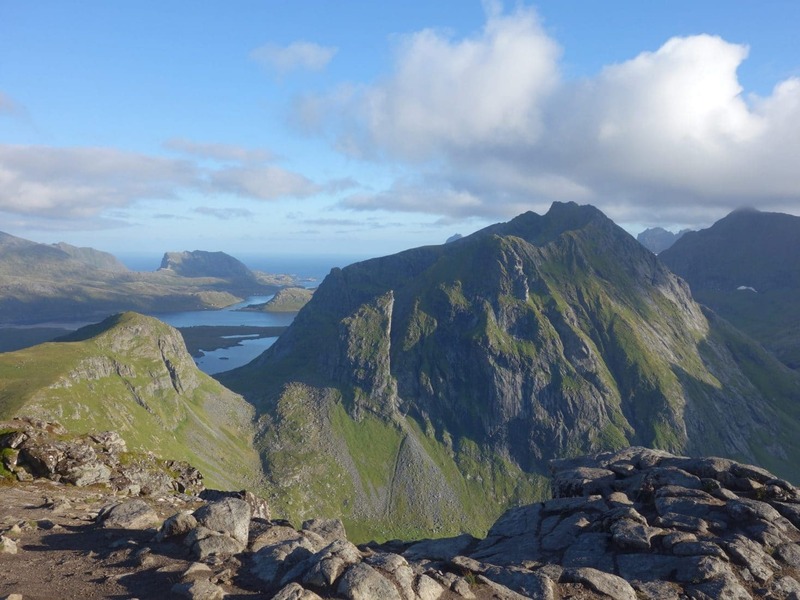 We take our time to admire the view and walk along the ridge. However, we have to think of going back because we have to take the ferry for Bunes. Back in the village we pick up our bags from our yesterday room and we head for the ferry. The ferry is an old fishing boat converted to go back and forth in the fjord. The trip is pleasant and above all fast. Our companions, Ian and Félicie will paddle 1h30-2h in kayak to Bunes. 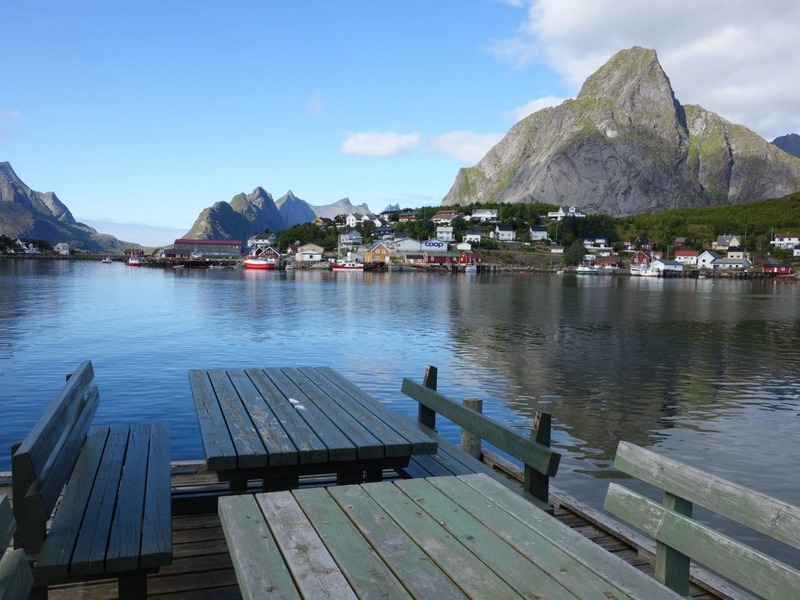 The arrival in Vinstad is done by a small pontoon on which a real crowd of tourists is waiting for the return to Reine. Luckily those are people who are just day tripping to the beach. Bunes is, therefore and hopefully, less crowded on the evening. Walking to the beach is fast. Follow the path along the fjord and turn left just after the small cemetery. All you have to do is climb up the small hill which is within 80m and there you are ! 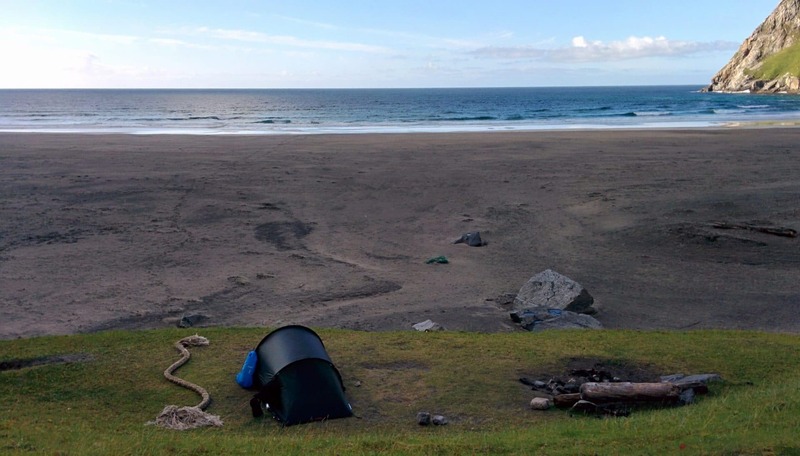 The beach is large and there is plenty of choice to settle our camp. We decide spend the night on the right part of the beach to be a bit away from people. 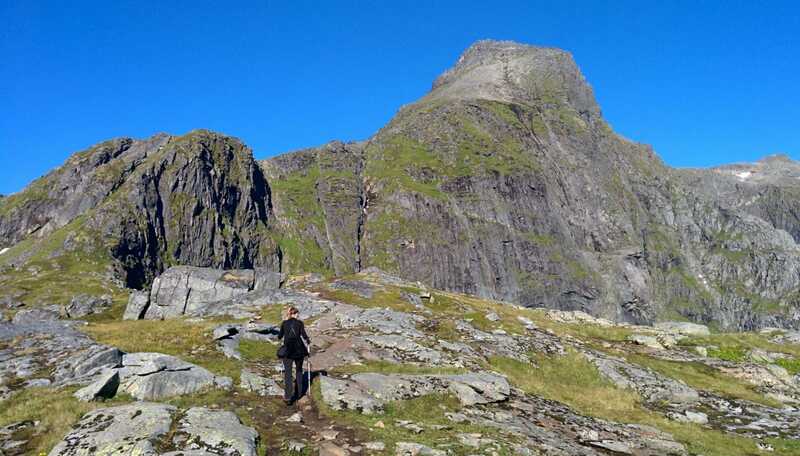 Bunes is overlooked by the Helvetestinden, impressive smooth rock face of 510m high. The place is very beautiful and soothing. The sea is quite distant because the beach is deep. There are many buoys stranded on the beach in the middle of the scattered vegetation. This is another great place to discover. We spend the end of the day enjoying the beach and its variations as the hours pass. In the evening, Ian and Félicie will join us, but also French, Americans and other Norwegians. We spend the evening chatting around a fire with the sunset that never ends in the background. 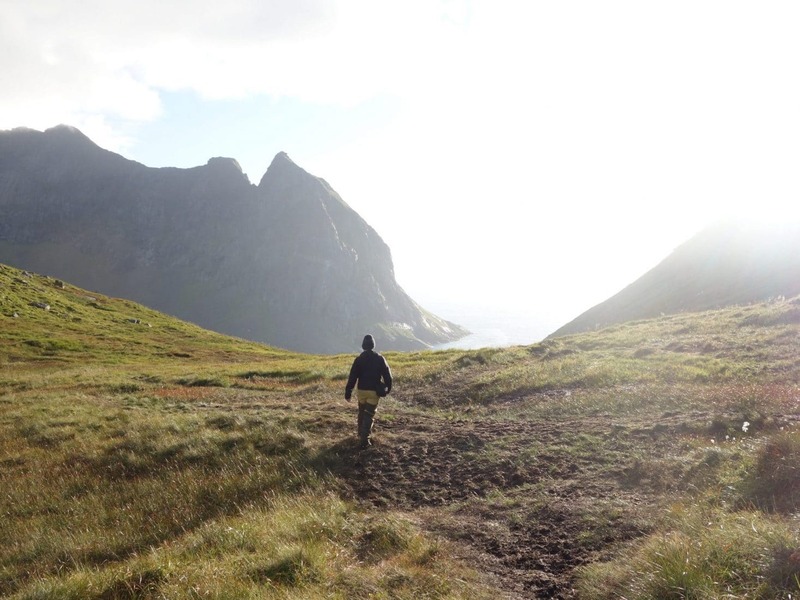 Day 7 : from Bunes to "Hill 448m"
Awakening in the shadow on this seventh day in the Lofoten Islands. But the weather is nice, which augurs a hike in the sun. 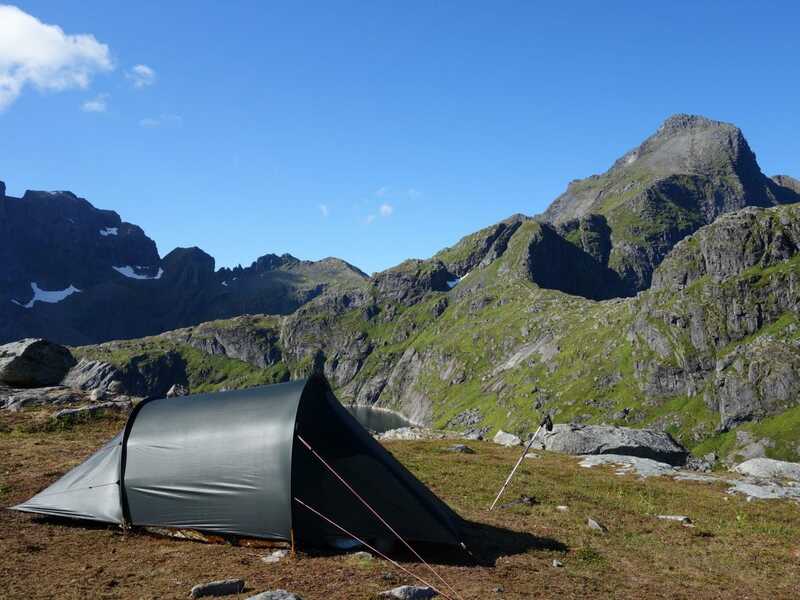 The goal today is to reach the summit of a small hill at 448m under the Hermannsdalstinden (1029m) which will be climbed the next day. 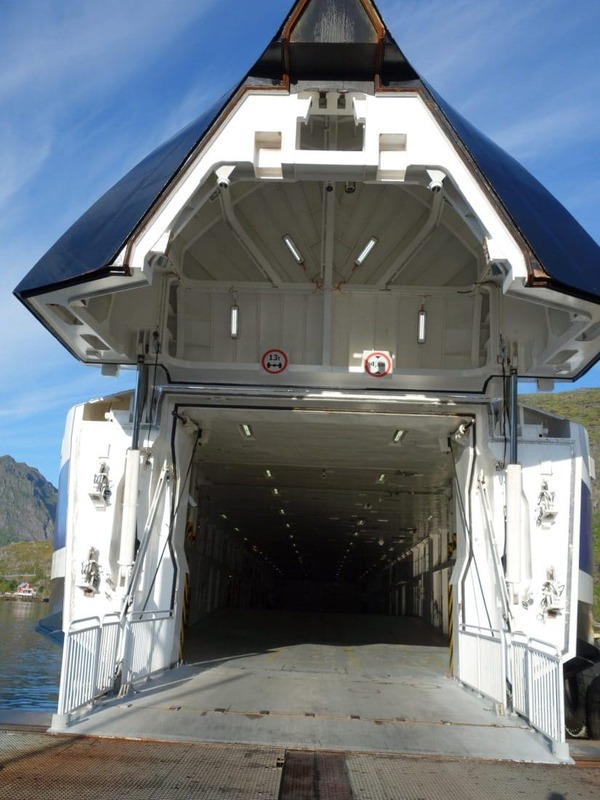 Normally a small ferry will allow you to be dropped off at the Forsfjorden power station, but according to the information on the internet, the ferry does not pass this year. So we’ll have to walk around the fjord. Afterward we notice that the information that we had was not good because we saw a ferry coming from Vinstad and going to the electric station. Relatively close on the map the station will prove to be longer to reach than expected. The path from Bunes is very bad and difficult. To reach it you must return to Vinstad and go on the right before arriving at the level of the pontoon. 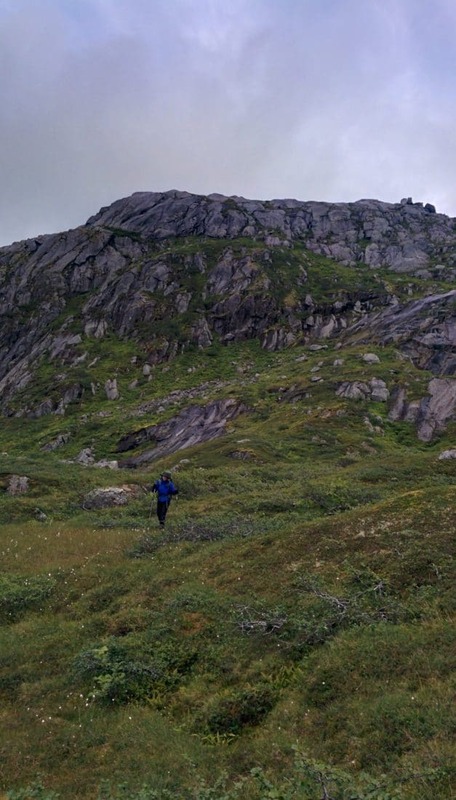 The path begins by following the fjord in rather spongy terrain but which allows a rapid progression. However, we arrive quickly in the “complicated” part: the greater part of the path passes by a path that slips through large rocks covered with moss and in dense vegetation. The mossy rocks, in addition to being slippery, hide holes covered with moss … So we pass the leg through holesvery easily and there, we risk getting hurt. We progress, therefore, gently, by groping with the sticks the ground before us. This portion is so long and boring. The power plant does not come close and it is really hard for a long time. We will finally get to the power plant a little broken by the fact of having taken so long to travel such a little distance. From the station we take to the right following the big pipe. The ground is very muddy and slippery. 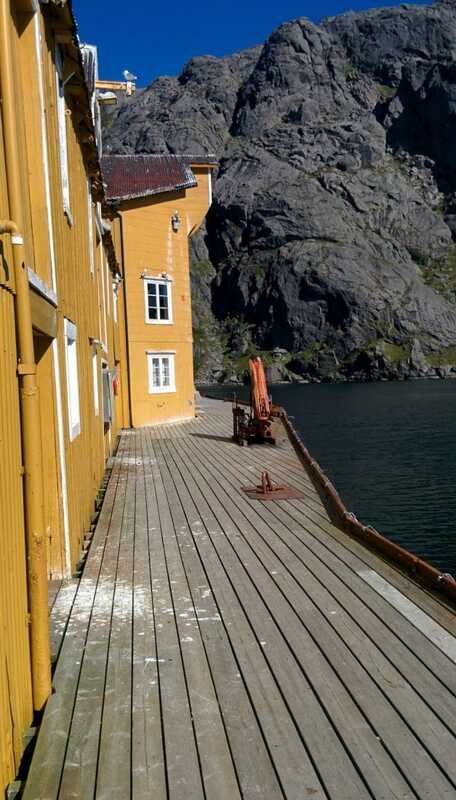 It climbs quickly over the fjord and the view is beautiful. The climb of the hill is steep but we finally reach its summit. We are very tired … We find a place to set the camp. This is an arduous task because although there are a lot of flat areas, these are mostly swamps. 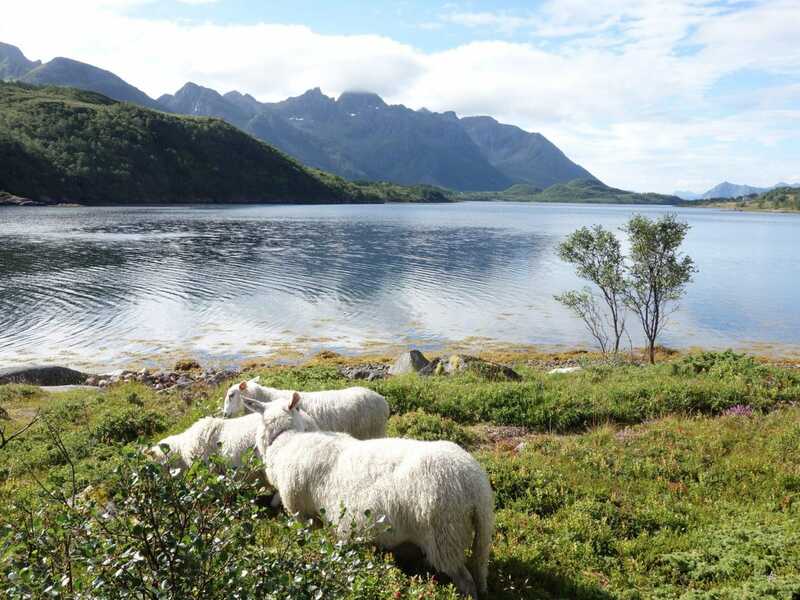 Finally we will find a good location whose view embraces the fjord and the Hermannsdalstinden. We enjoy this beautiful place in the sun for the rest of the afternoon. Another long day of walking even though few kilometers were made. Tomorrow we will climb the highest peak of Moskenesoya, the Hermanndalstinden. We get up this morning under a great sun. Head towards the summit of the Hermanndalstinden (1029m) this morning. We leave the camp relatively early in the morning after having a good breakfast. 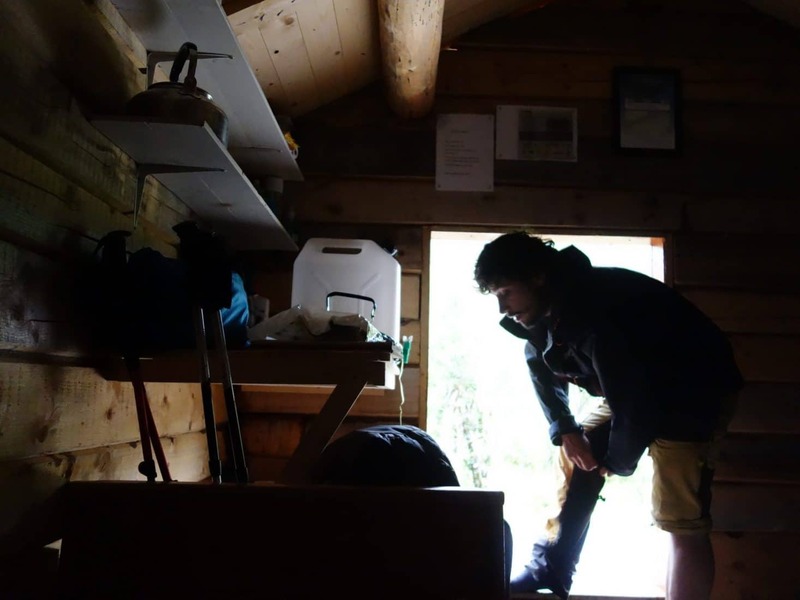 We leave light, leaving the tent and the big bags behind and taking only the bare necessities for the return trip. The trail begins by descending almost to the level of the lake and then back up into a relatively narrow path, muddy and lined with dense vegetation that can hide some holes. We will meet a couple who goes down and who had to spend the night higher. The view is rapidly becoming more beautiful. The ascent is deemed difficult especially in rainy weather. There are no difficulties on the beginning of the path but the following section can be scary if one is not accustomed to a little air and emptiness. The road climbs suddenly strongly on a ridge that leaves a lot of air especially on the left. Chains and ropes were installed to help the walker. We went there while the terrain was dry but I think that doing this portion in the rain may be slightly more dangerous and in any case we should not be impressed by the vacuum. The advantage is that you quickly take the difference in altitude. Arrived at the cairn of the previous picture the path leaves on the right. Vegetation is beginning to become scarce. The climb then continues on a path that could recall a trail of the Alps. The view is very beautiful and unobstructed, it promises for the suite. On the end, the path is 100% mineral. We are not even at 1000m and it looks like 2500m in France. Only a few lichens remain. On this part the path becomes a little less visible and red paint points give the direction to follow. We finally arrive at a small pass (very windy when we were there) that is not yet the summit. This one is a few tens of meters on the left and is marked by a post. To reach it you have to go through large rocky blocks that must be slippery if wet. We take the time to savor the moment, alone, well sheltered from the wind. After this moment of plenitude, we decide to go down again. We will meet some groups of people going up. Some will not pass the passage with chains and ropes. 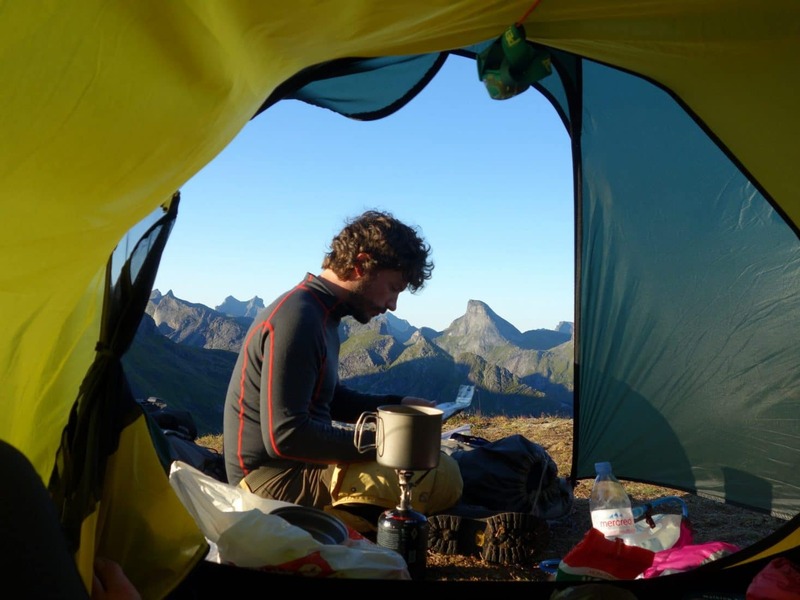 Once back at the camp, we give ourselves a small lunch break before re-bags and head towards Munkebu. The path is relatively simple to get there. 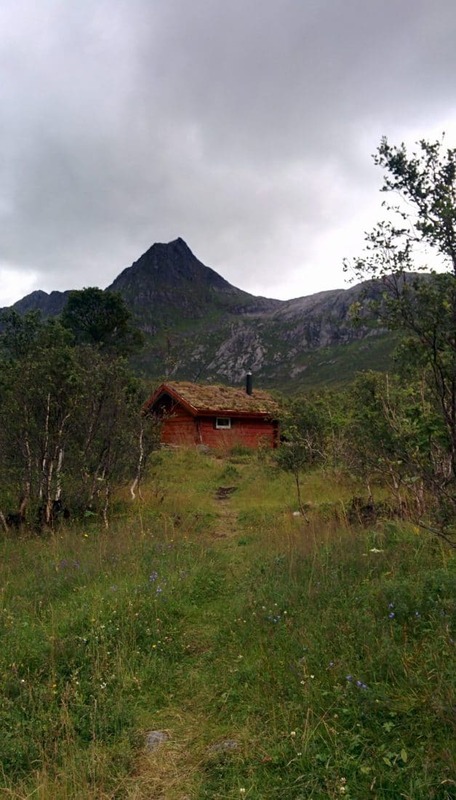 Munkebu is a refuge located under the Munken. Several bivouac spots are available in the area. 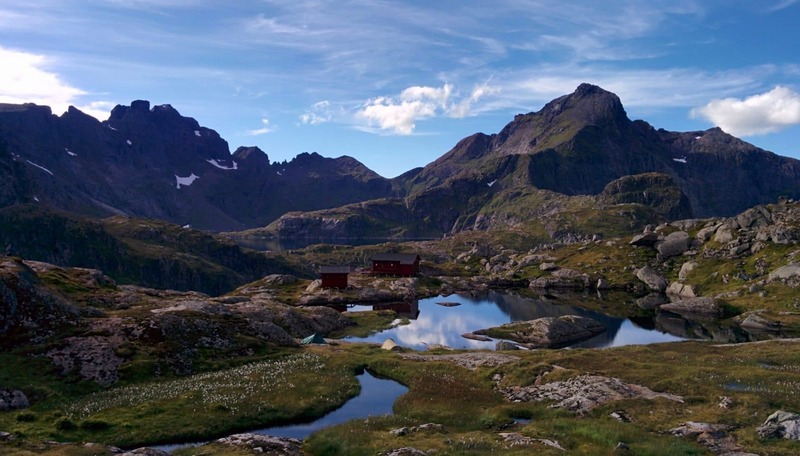 The refuge itself is accessible only if you have the keys to be collected in Sørvagen from the DNT (Norwegian Alpine Club). 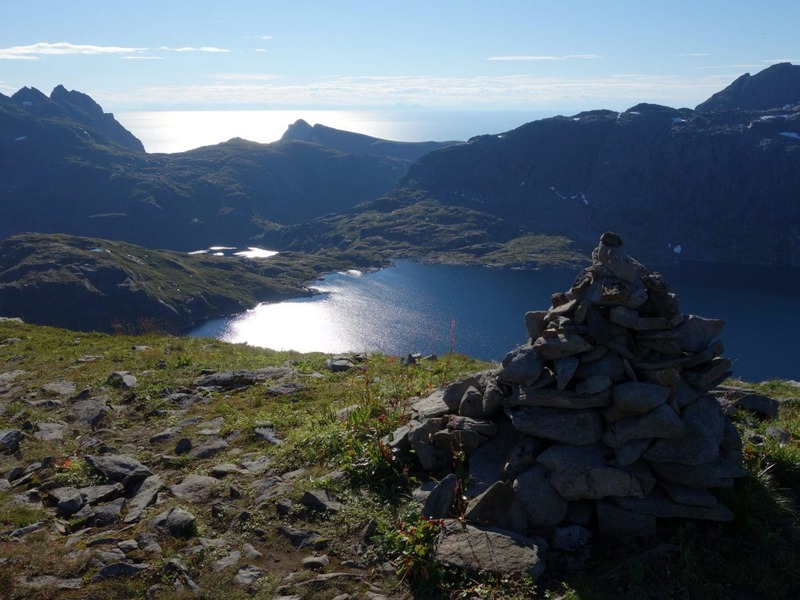 The Munken is within walking distance and offers a beautiful panorama of its summit. Concerning the campsite, the area is quite swampy, there are pitches to put the tent but not so much in the end if you want to be dry. For our part we will choose to put ourselves on the heights to have less moisture. We have a lovely view of the refuge with the Hermann as a backdrop. We will end the day that will have been sunny all along again. 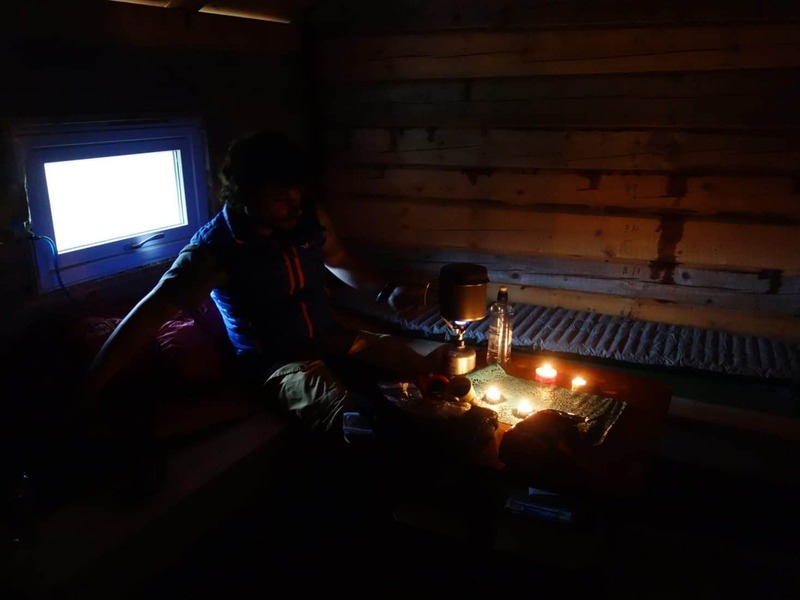 The night has been wet… Munkebu is really a beautiful place but not necessarily the most suitable for a bivouac. So we leave the area after packing everything again, direction Sørvagen for a return to civilization. 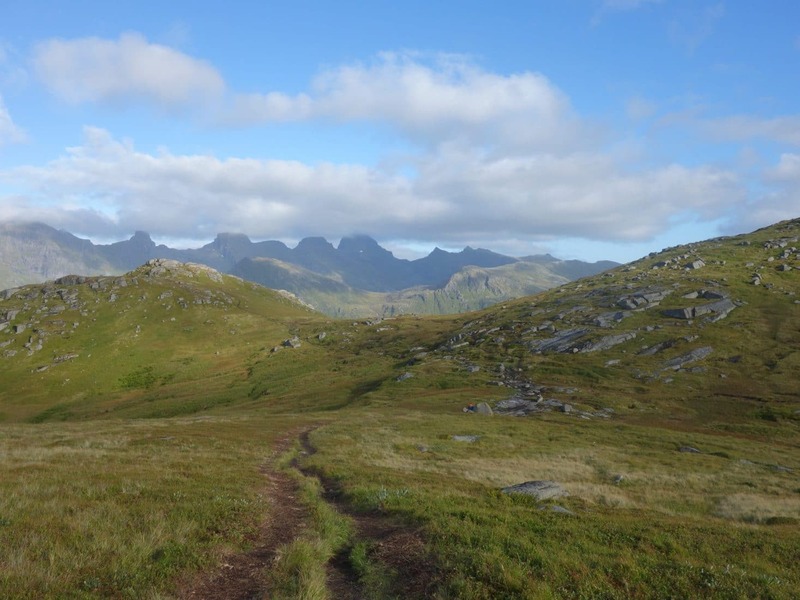 The beginning of the path undulates between small secondary summits. We stay on the heights it is beautiful even if the weather is more sullen today. We then begin the descent which will be progressive on the beginning and quite steep at the end with some passages with chains and ropes to help; but nothing impossible. We meet a few people who certainly climb to Munkebu for the day. The day was not very busy. We will end it by a walk in the city and especially a good meal at the Maren Anna which serves a very excellent cuisine! 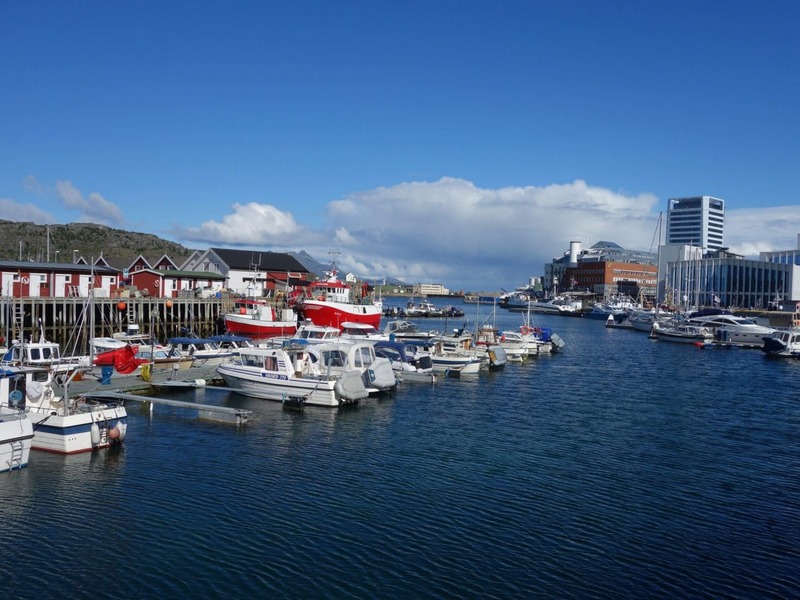 Some guidebooks suggest a round trip to the Hermanndalstinden from Sørvagen during the day. I do not doubt it is feasible but I think it requires a good physical condition and especially to travel light. Moreover it leaves little time to take the time which is also a pity. 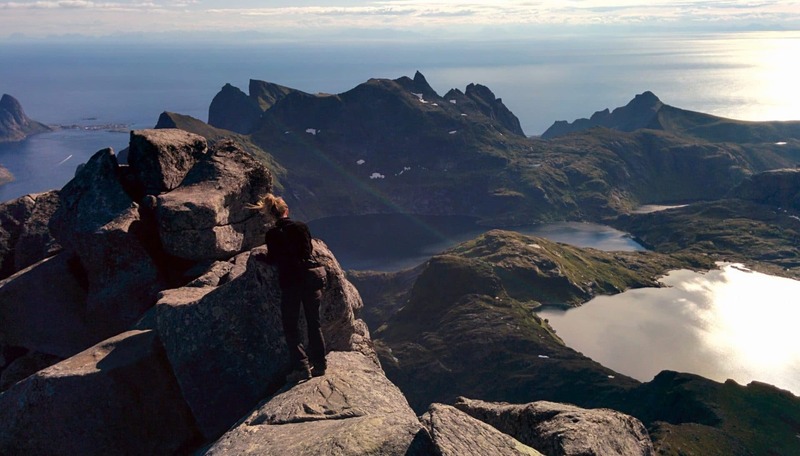 Another possibility is to do the opposite of our way: from Sørvagen and finish to Reine by the ferry which is already more possible in a day. Transition day today. 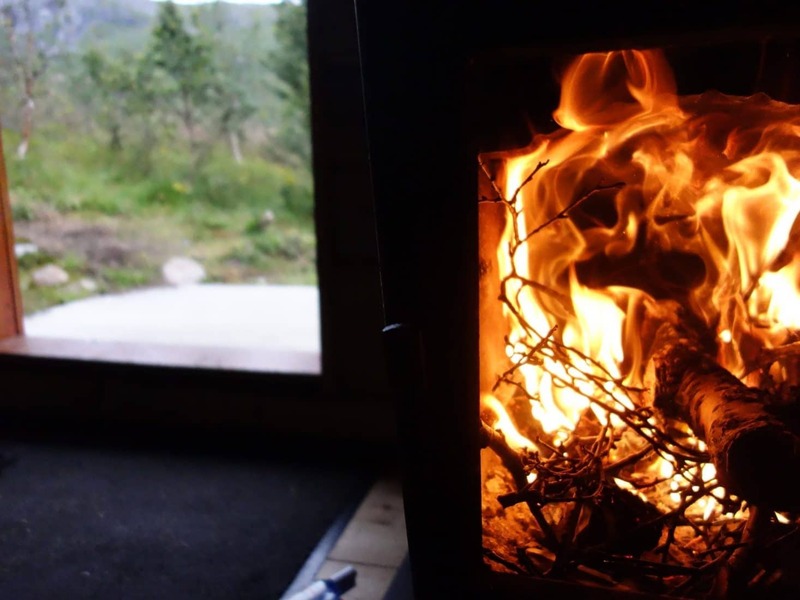 We chose to leave for Væroy the next day, so this day will be devoted to the visit of Å and to rest. To reach the small town of Å which is at the end of the E10 is relatively easy and fast from Sørvagen following the road. The scenery is beautiful along the route and fortunately there is not too much traffic. The coastline is not far from the water, passing by small local villages. Å is a small village museum at the end of the road. We were afraid it would be ultra tourist because there is a large bus parking and that is quite well known. Luckily there are not any crowds. 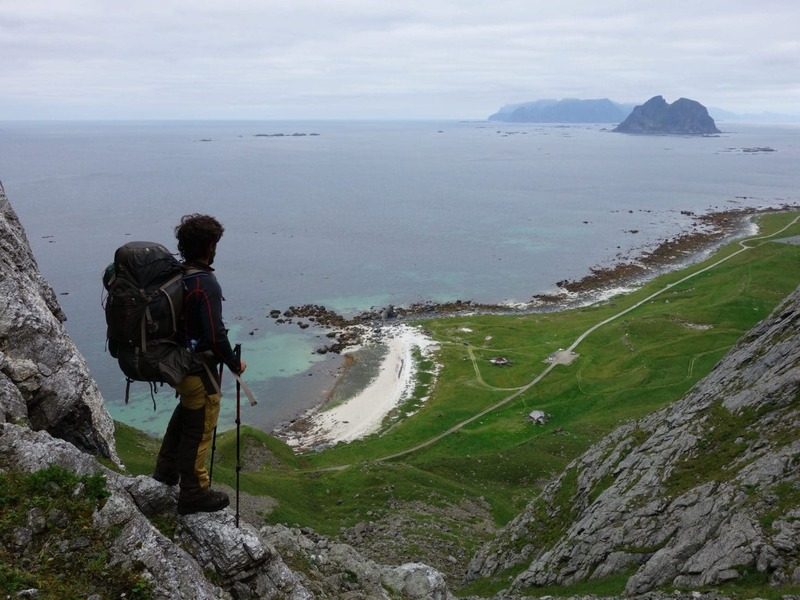 We will cross Félicie, our friend from Reine, right at the entrance of the village who is hicthhiking to return to Svolvaer. We start our tour in the village by buying bread and cinnamon rolls with a coffee in the bakery of the small main square. We will then land near the water to enjoy the sun and viennoiseries. 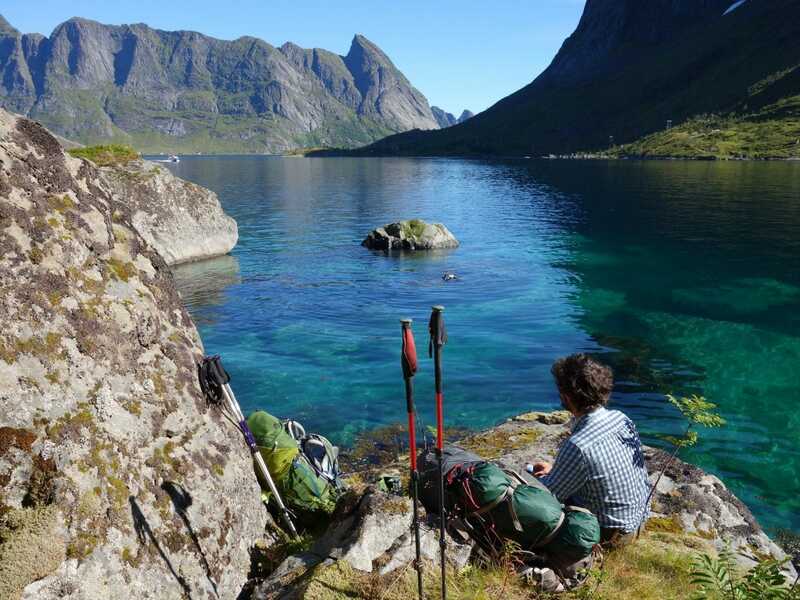 We will be joined by two groups of French with whom we will share our experiences of Lofoten. We will take a further tour in the village. This is not very long given the size of it. 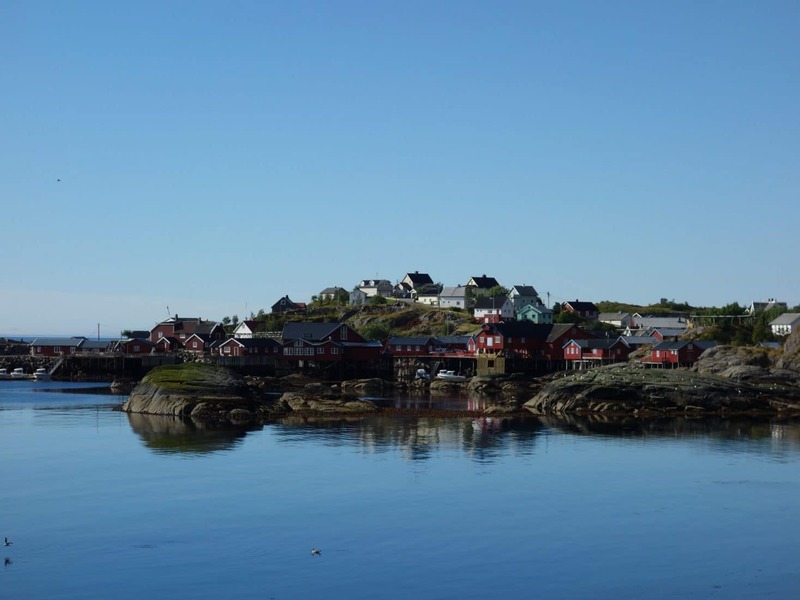 The village is friendly but not extraordinary either when compared to Nusfjord. We do not stay very long in the end. 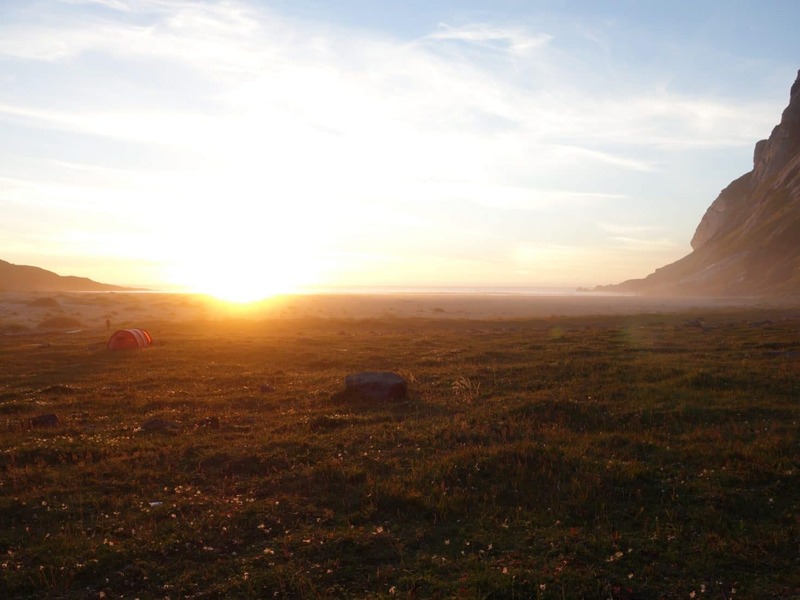 We prefer to go to Moskenes, stay at the campsite and enjoy the late afternoon. We therefore take the road on foot in the opposite direction. 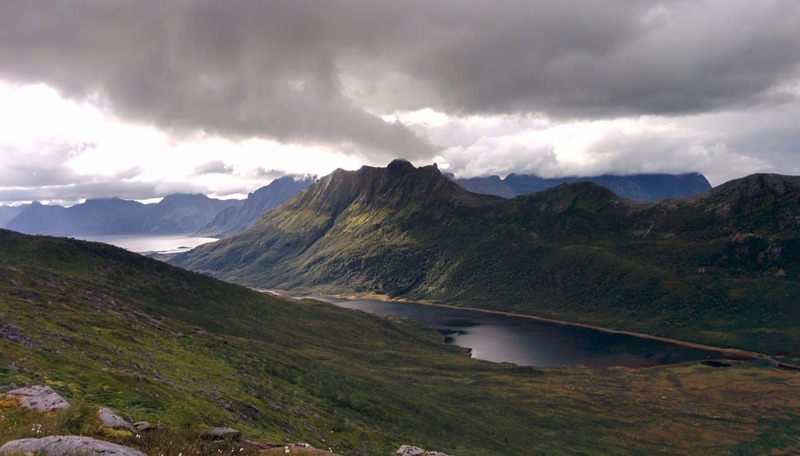 Several beautiful excursions are possible from Å: one of them is the beach of Stokkvika passing by Ågvatnet Lake, another beautiful hike is the ascent of the Andstabben (514m) west of town. 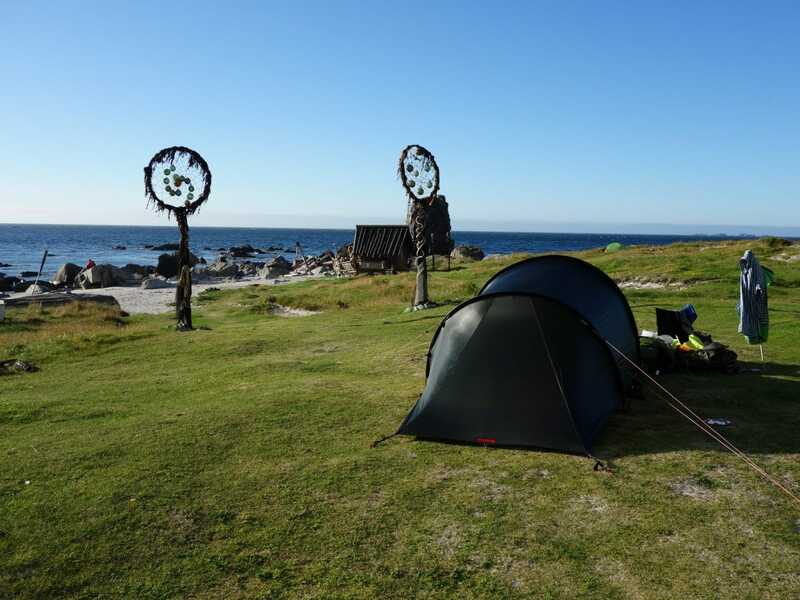 As we take the ferry tomorrow in Moskenes we choose to spend the night at the small campsite of “Moskesnes Camping As”. 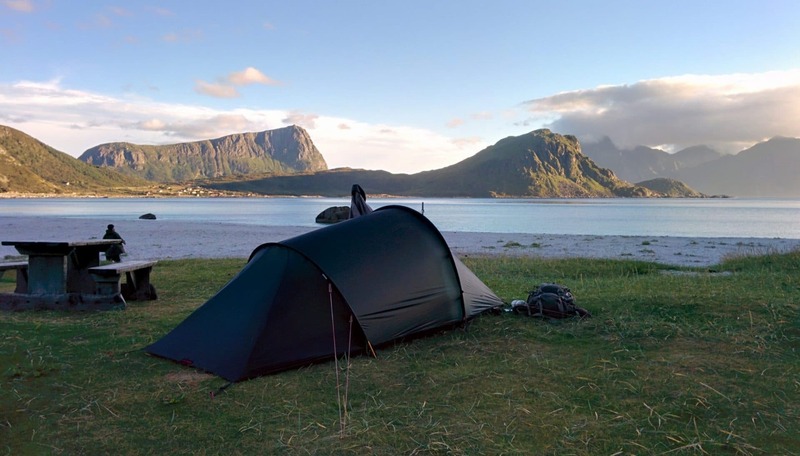 The place is ok but we can take a shower, do a little laundry and have a beer under the Lofoten sunset. The end of the afternoon and the evening will thus pass calmly. 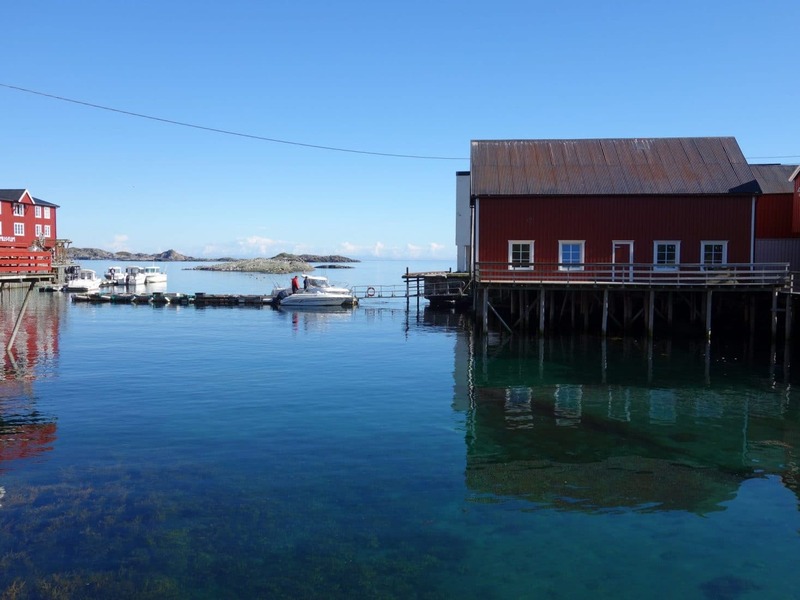 Tomorrow we leave the main islands of Lofoten in the direction of Vaeroy. Before we talked about Vaeroy as such, I wanted to explain why we were there. 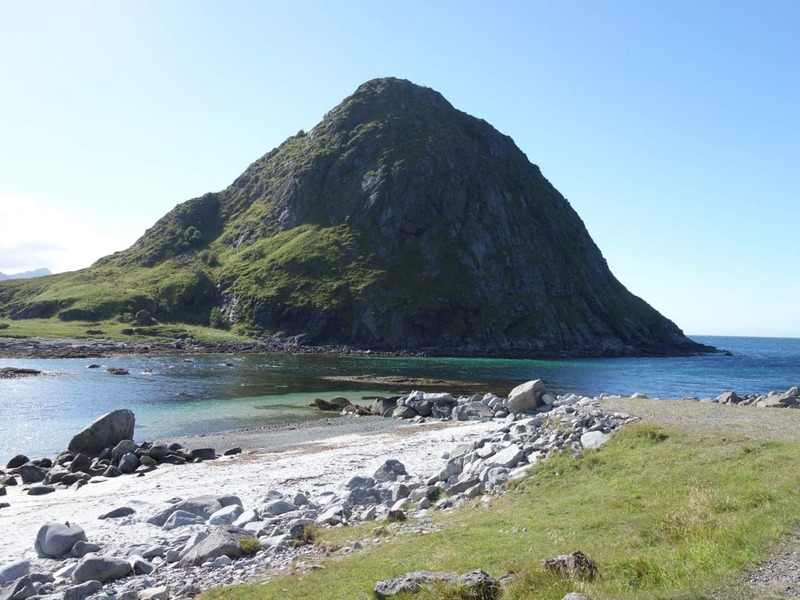 First, we hitchhiked with a couple who had spent a few “unforgettable” days on the small island, another couple who drove us originally from the Lofoten and had sold us Vaeroy as “special” in the good way; finally some photos and his isolation had finished persuading us to go there. We will see. 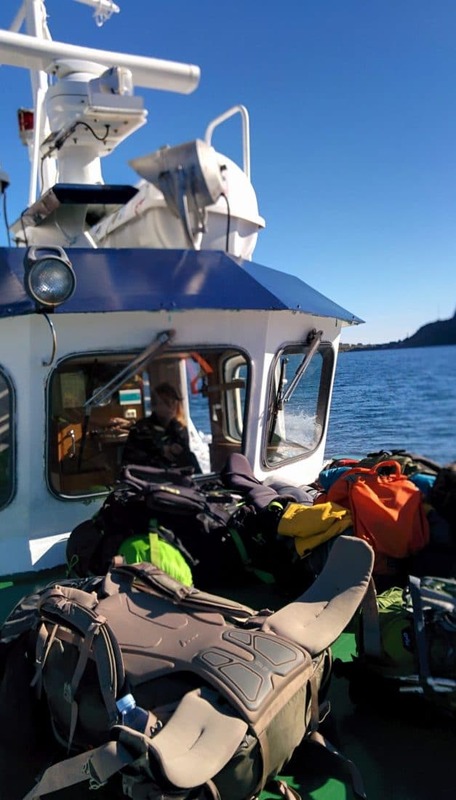 To reach the island, we start from Moskenes via the ferry which then reaches the mainland (via Røst). The crossing takes about one or two hours. 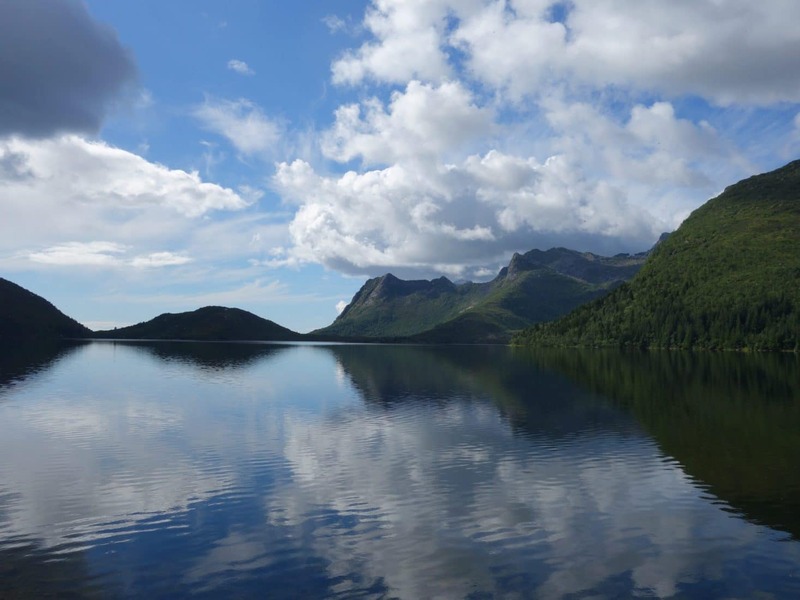 The arrival will be made in a cloudy weather on a concrete landing without charm… There are not many people who come down or not many people who get on the ferry … Let’s see in the village of Sørland. 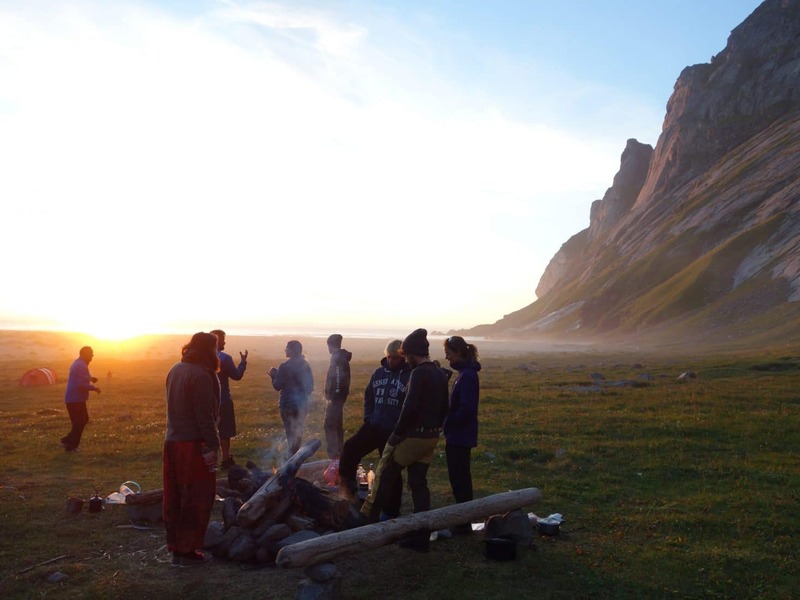 We decide to reach the beach at the end of the road on the north coast not far from the disused aerodrome which hosts the “Midnight Sun Festival” during polar day. The road passes through a small pass and then follows a coastline of little interest. The path is relatively long to the beach. We will get there after a local stopped to drive us there. The beach is nice: in its back are large vertical cliffs on which the clouds form. 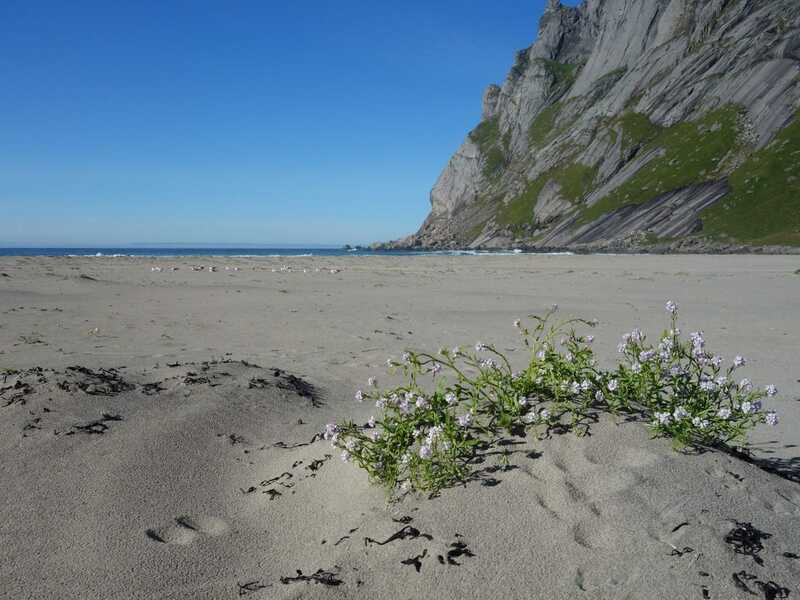 The beach opens to the ocean with a nice view of the Lofoten. It’s still gray but it should change. On the beach and in the surrounding area there are traces of the festival in the form of pebble or wood sculptures, large wooden huts on the beach or a fake pirate ship stranded. The whole is nice and looks like a old pirate place. We spend the evening strolling along the beach or on the road that runs along the coast to the west. The sun will return in the late afternoon so we warm up a bit and allow to dry the moisture of the day. From our eleven days this day is the least sympathetic at the moment. We shall see tomorrow what Vaeroy has left us. The next day we do not really have a plan. 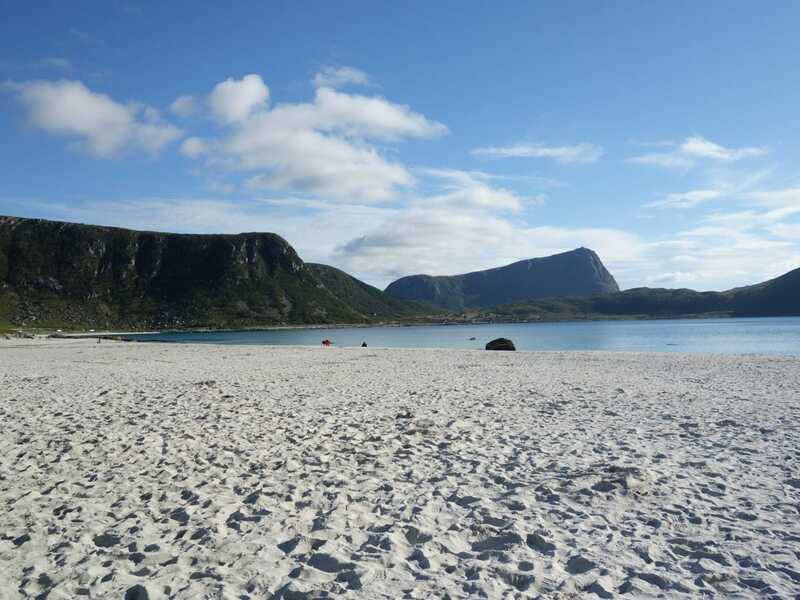 We wish to reach Sørland by cutting through a pass above the beach and going to see the famous sight of the horseshoe. 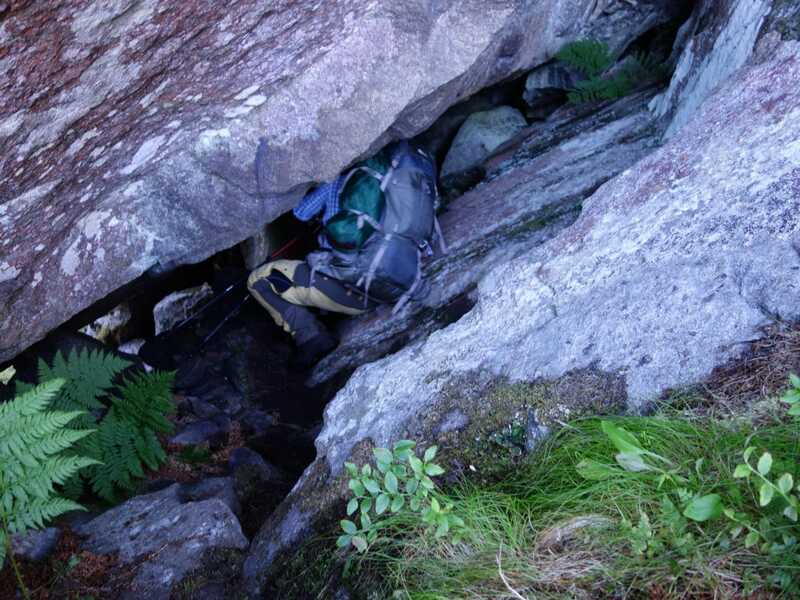 We pack all our equipment (for the last time) and attack the climb by the well visible path that leads to the pass. This one is steep but not complicated and offers a nice view as the area. 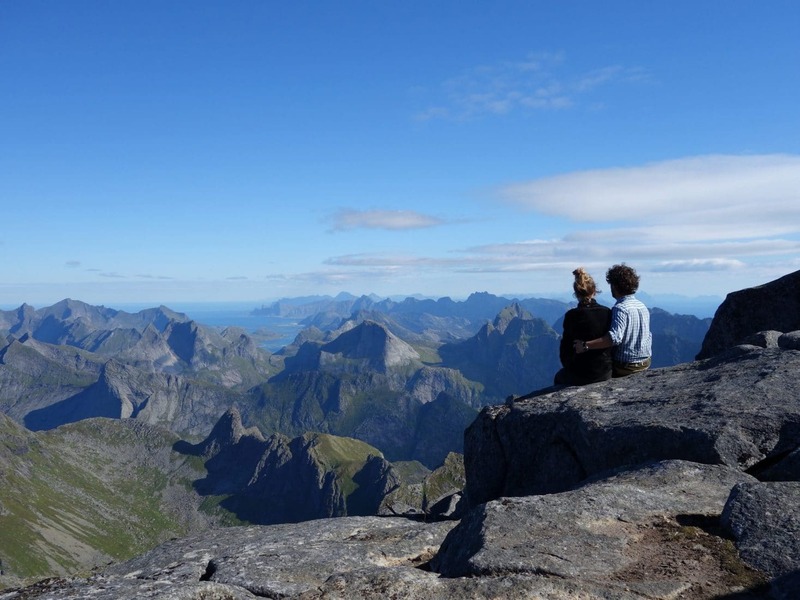 From the top you can also see the small town of Sørland and the particular physiognomy of Vaeroy with its large plain surrounded by high cliffs. We then wanted to reach the point of view that we see everywhere and that allows to admire the horseshoe cliffs. Unfortunately we will be wrong thinking that the view was accessible from the radio station. In fact no, you have to fork to the left but we have not really seen any panels or even clear path. So big disappointment … this and the weather and the general atmosphere of the island is a bit depressing… So we decide to join the city and find a hotel. One of the few hotels on the island is in the harbor area and has no charm. We will have to wait for an hour that the receptionist arrives but “fortunately” we will be accompanied by two guys completely drunk and relatively freaking that we will not get rid of until we have the room! We will take the ferry at the first hour the next day. 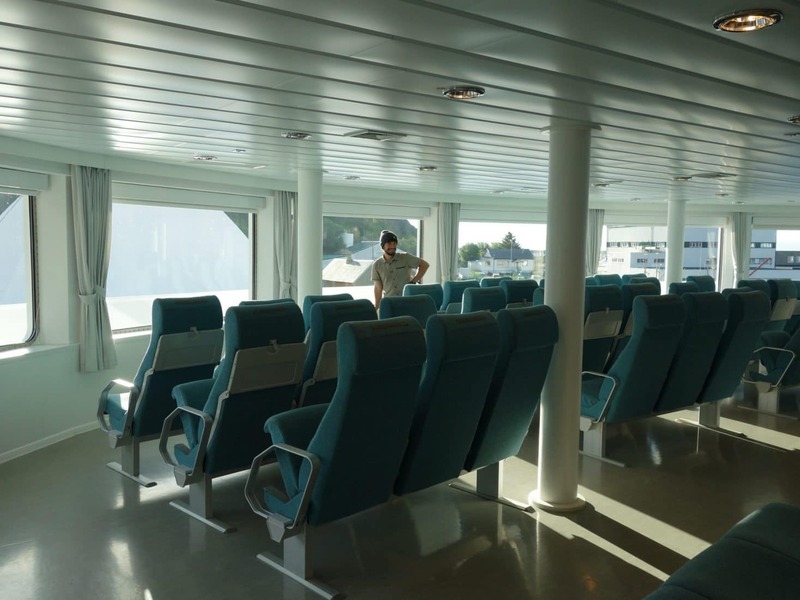 The ferry between Vaeroy and Bodø takes about 5 hours and passes through Røst. Enjoying the view of the sea. 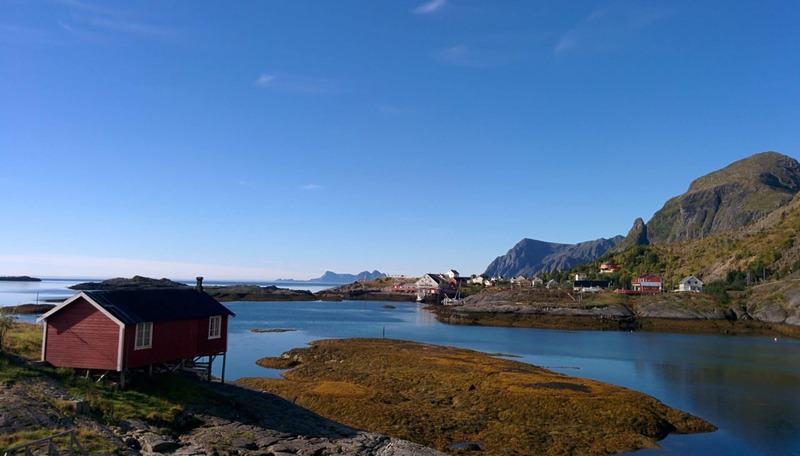 Back in Bodø we join the Airbnb that we had booked with a Norwegian who lives here for 3 years. We will pick up our bags leaft at the check-in at the airport. The end of the day will mostly be marked by a big pizza at Bjørk in the city center. For the return we will take two planes with a stopover in Oslo. 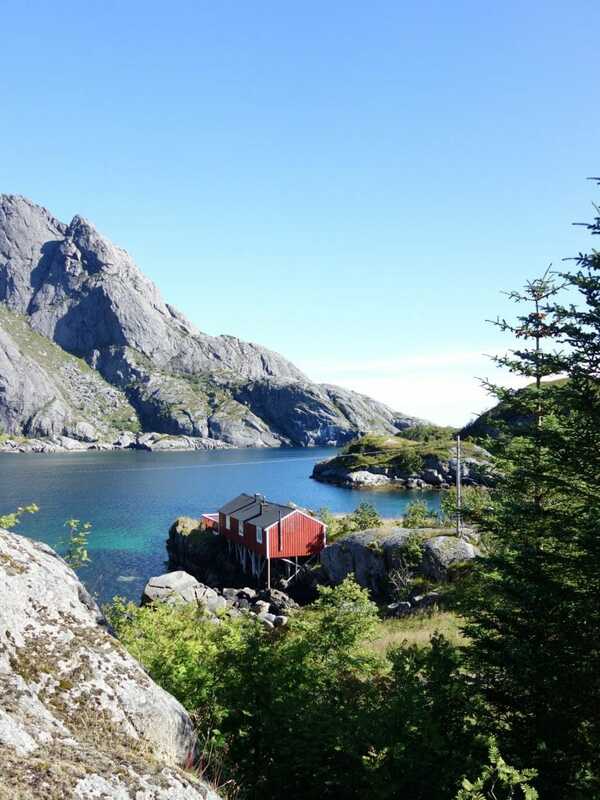 It’s faster than the train … Bye bye Lofoten and Norway after these two busy weeks. This trip have been for us one of the most beautiful we have ever done. Definitely in the TOP 3 of the most beautiful destinations. 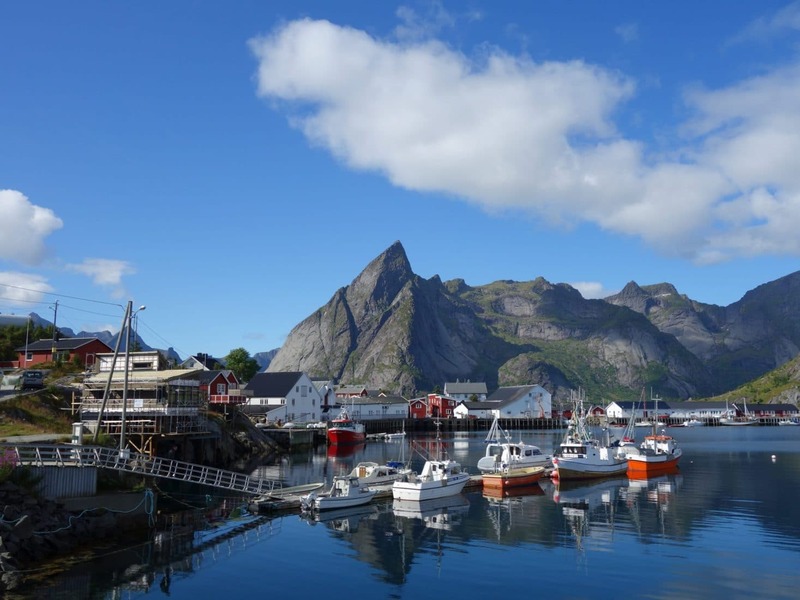 We had made Fjords ofNorway the previous year but the Lofoten Islands have nothing to do with the south of the country. These mountains with their feet in the water are truly unique, magnificent. We stayed there for fourteen days but felt as if we had not made half or a third of the possibilities offered by this extraordinary playground. On the plus side, there are not too many people and a lot of tourists stay along the main road so as soon as you walk away you are alone. We had during this holiday an insolent chance with the weather: only three days of bad weather! 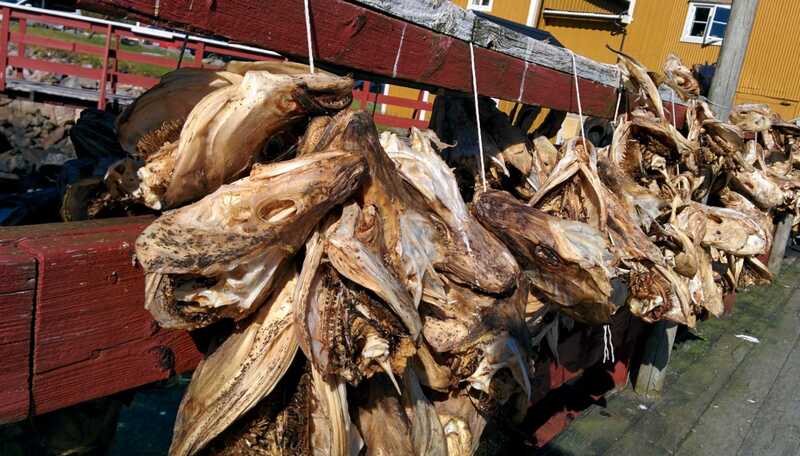 It is extremely rare in these islands. In addition we have even had quite comfortable temperatures near the 20 ° C.
Aside from the landscapes and the weather we have also meet a lot of very nice people, in the spirit of “backpacker” which is nice to exchange, share. 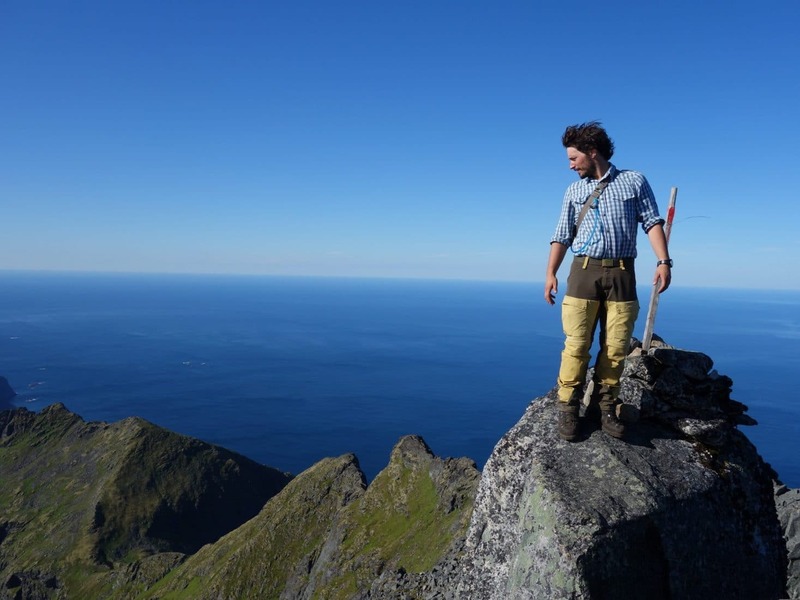 I advise to 200% to visit of the Lofoten Islands and especially to take the time to explore them. One thing is for sure we’ll be back, I do not know when, but we’ll be back!